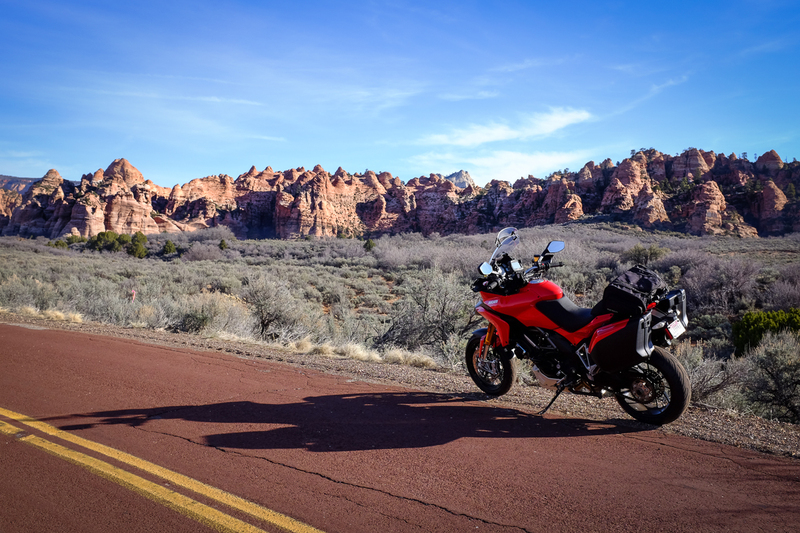 As a long-time motorcyclist [in other words, I'm somewhat mature] and photographer, when I ride (which is often), I'm riding about 80% as an aggressive thrill-seeking former racer, while about 20% as a photographer with an eye or two on the passing scenery. 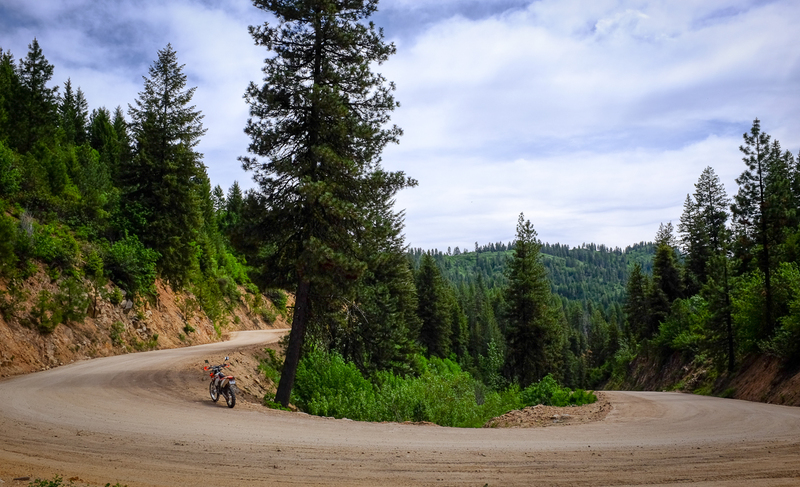 So, as anyone who rides with me knows, whether on asphalt or dirt, I tend to stop along the way a fair amount to shoot photos. I just have to. 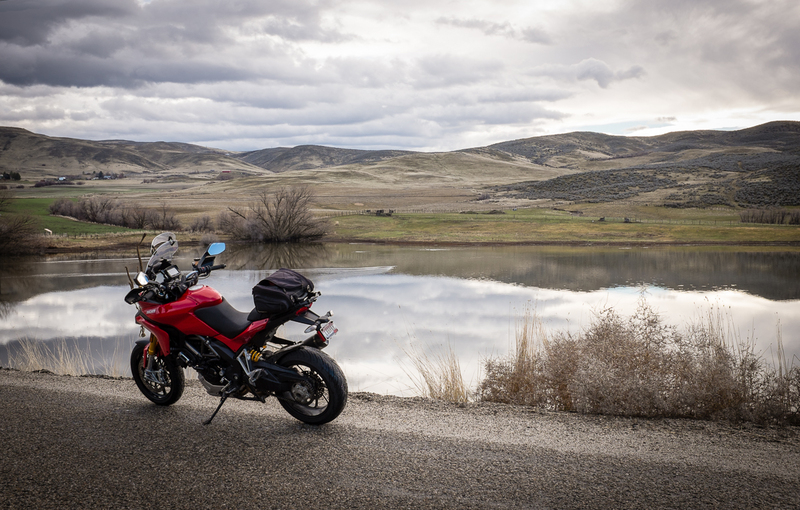 One of the main reason I own bikes is so that they can take me to cool places where I can take photos. I love it! So, I figured I should just go ahead and create a thread dedicated to sharing these adventures and photos with others who share my passion for both activities. I post a lot of stuff on my blog: bwhip's blog. I'll add content as I take more rides and make more photos. I hope you like! 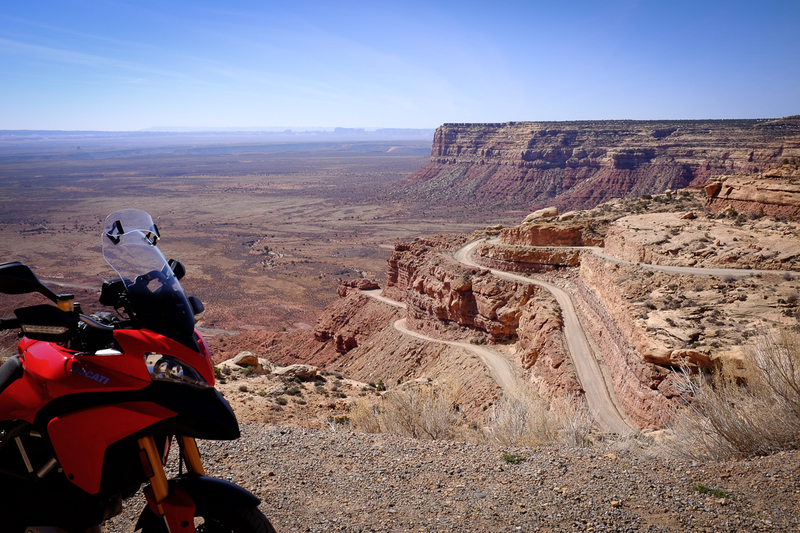 Ive enjoyed my early spring trips to southern Utah so much the last couple of years (2014 Trip), (2013 Trip), that Ive been thinking that I really need to get back down there. Id also been thinking it would be fun to explore some new areas down there that I hadnt yet had a chance to experience. 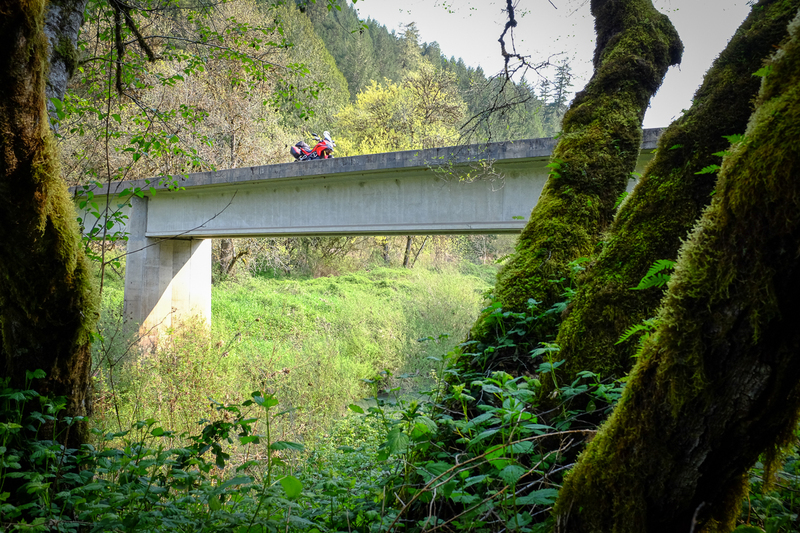 The weather in this region recently has been so unseasonably warm and dry, that my impatience was giving me a strong early case of spring fever, so I started looking for an opportunity to break away from work for a day or two to make this happen. 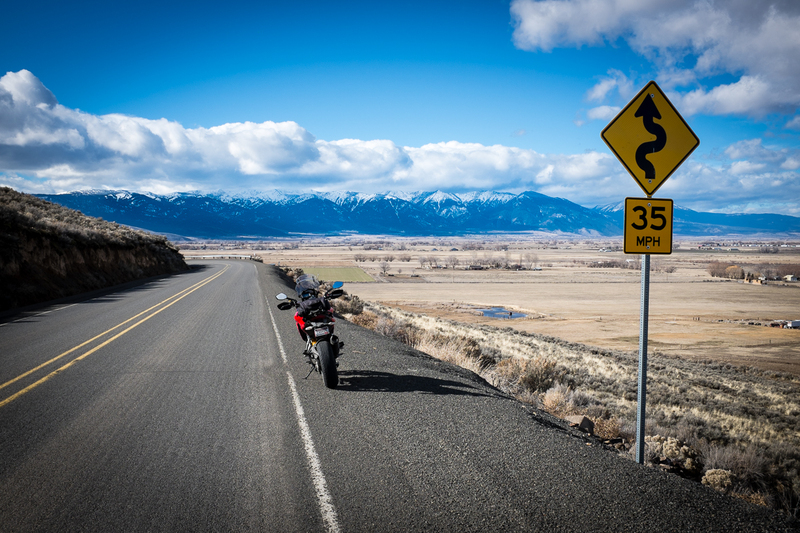 830 miles or so, spread over 2 ½ days, which would give me time to explore a bit, stop for photos, and not feel completely rushed. 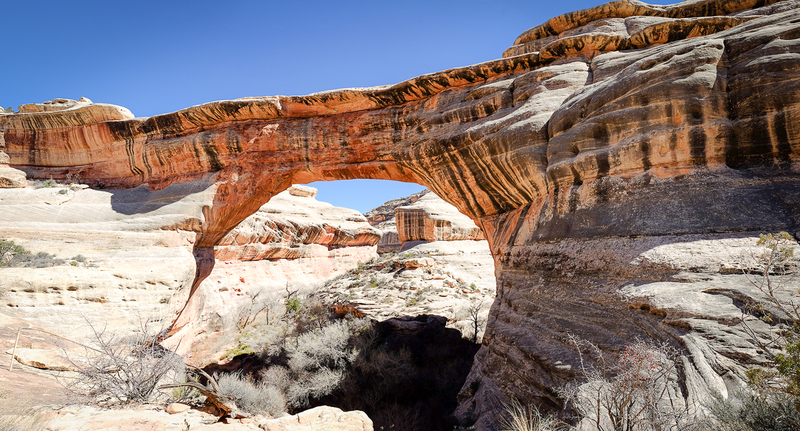 This route would take me to see some cool sites that Id been wanting to see, and return me to Natural Bridges, where Id been a couple of years ago. Id hiked down to one of the three massive bridges there last time, and thought it would be cool to hike down to another one, since Monument Valley isnt that far from there. 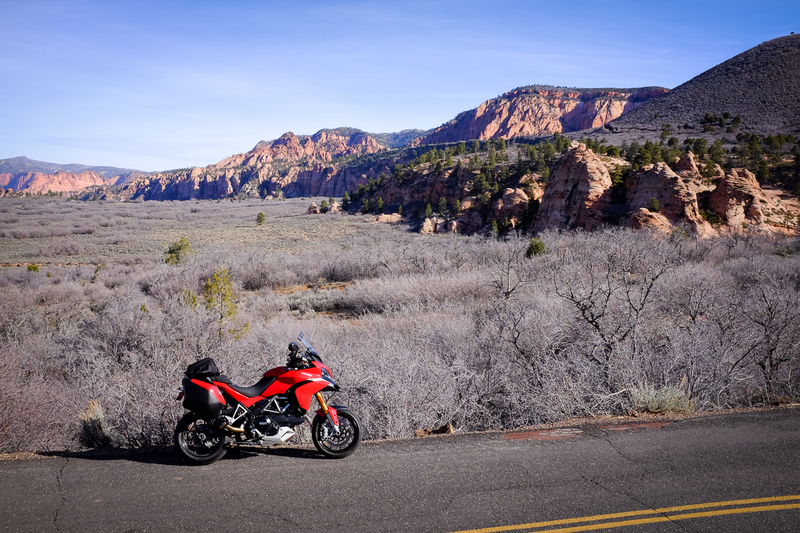 Id read good things on the web about the Kolob Terrace Road just outside of Hurricane, UT, so I made that an early part of my trip. It was a great way to get started on Saturday morning. 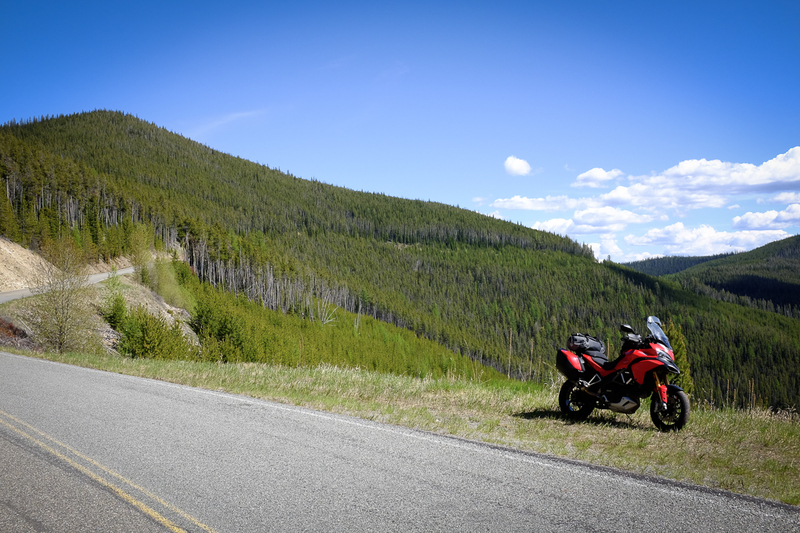 Very few people or cars along the way, and some nice, twisty roads with beautiful scenery. 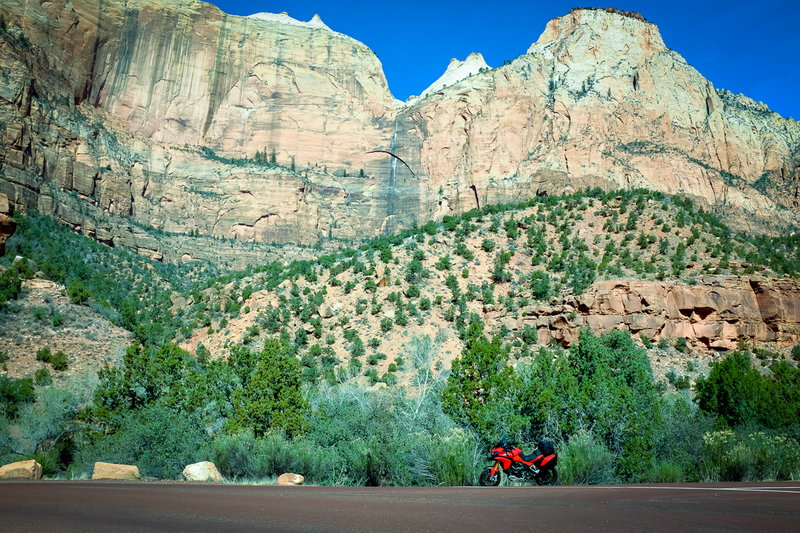 I ran into snow before I could make it to the reservoir at the top (one of the risks of traveling this early in the season, I guess), so I turned around and headed toward Zion. As I got closer, I got slowed way down by unexpected traffic. Too early in the season for this! I know the weather is nice, but I usually go early in the season to avoid crowds and traffic. I soon discovered it was mostly due to a half-marathon that was going on along that route, and once I finally entered the park it was smooth sailing (thank goodness!). The route through the park is fairly brief, but absolutely breathtaking! 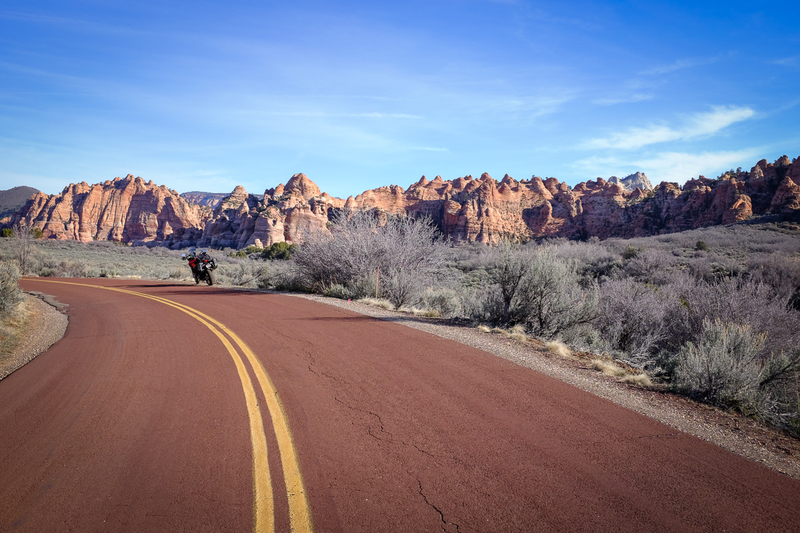 The walls of red rock are just amazing. 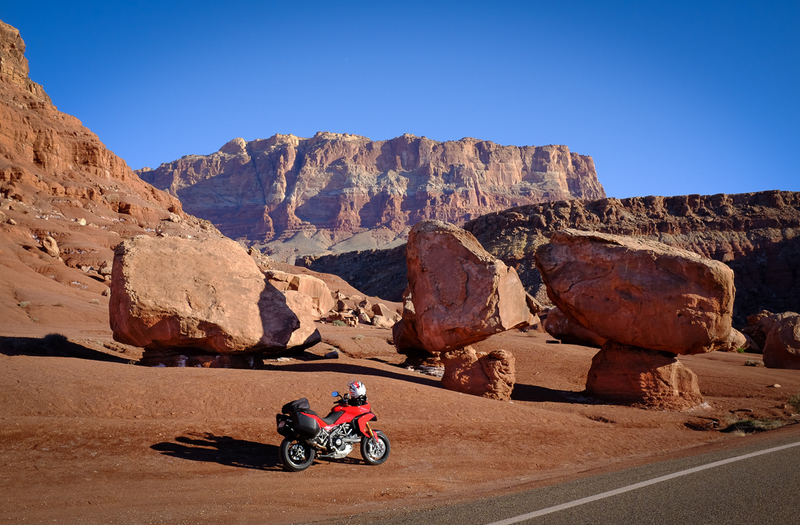 You can see by the size of my bike just how massive that wall of rock is behind. 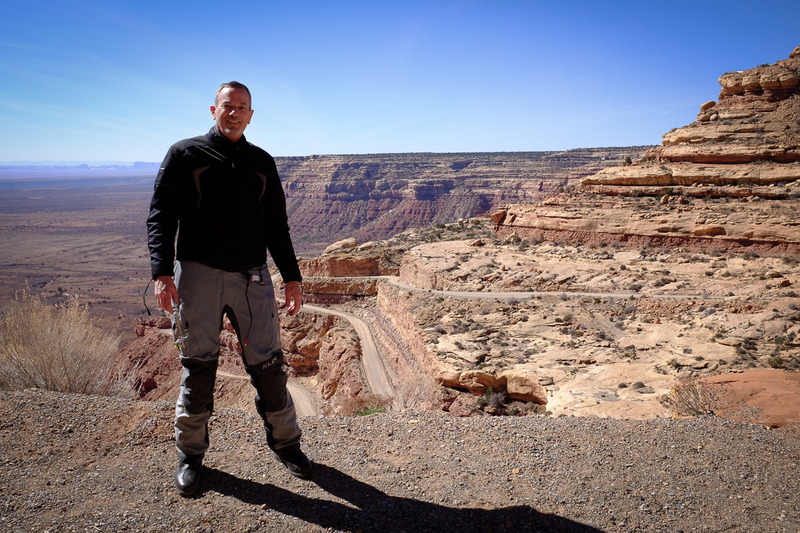 In this one you can get an idea of how huge the cliffs are by looking at the size of the road in the distance (lower left). After Zion I took a detour north on Hwy 89 toward Glendale, thinking there might be some nice scenery and a place to get some lunch up toward Glendale. Nope, nothing really much to see or do along that stretch. Oh well, it was worth a shot. 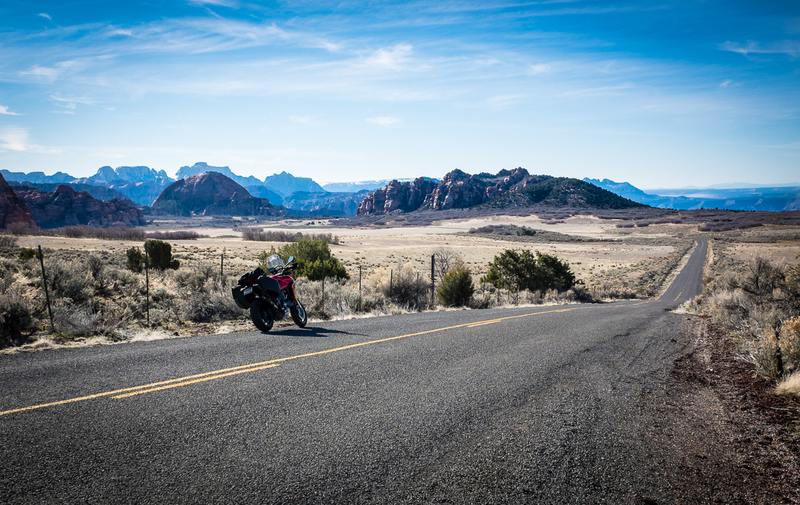 Next I rolled on toward Page, AZ, where Id be spending the night. 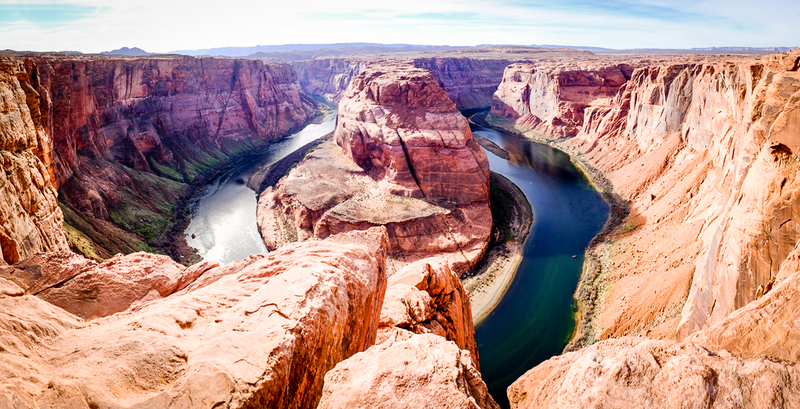 Id been wanting to check out Horseshoe Bend there along the Colorado River/Grand Canyon, because the photos Id seen of it were amazing. 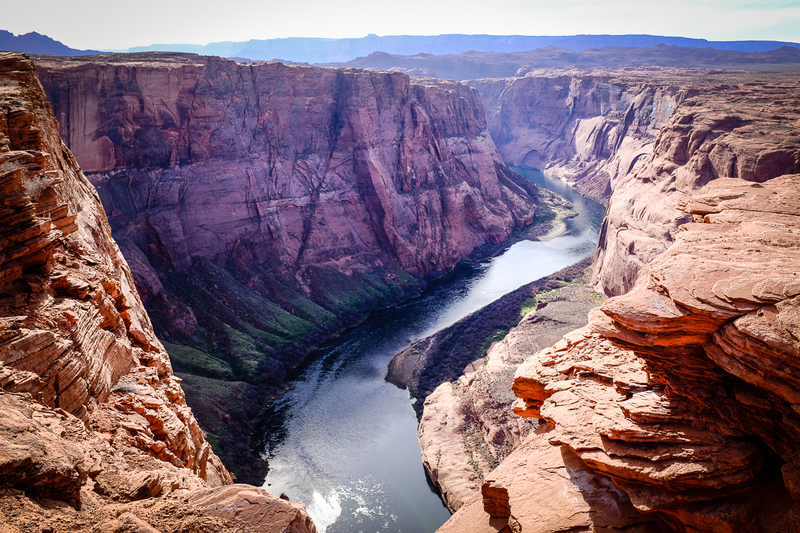 I checked into the hotel mid-afternoon, took a shower and relaxed a bit, and then put on my hiking boots and rode the mile or so over to the parking lot at Horseshoe Bend. You then hike over a little hill over to the actual edge of the canyon. You know its out there as youre getting closer, but suddenly you step right up to the edge of a 1,000 foot drop and see this! Ive seen a lot of cool sights in my life, but this one may be the most spectacular ever. Mind-blowing, breathtaking, unbelievable. Adjectives fall short, and certainly cameras do too. Its so large and monumental, that you can only fit so much of it into your cameras lens at one time. Even with a wide-angle lens on my Fuji X100T, this is actually a merge of 20 individual photos stitched together in Photoshop. And the fact that you just walk right up to the edge  no wall, no fence, no railing. Its really quite a special place. 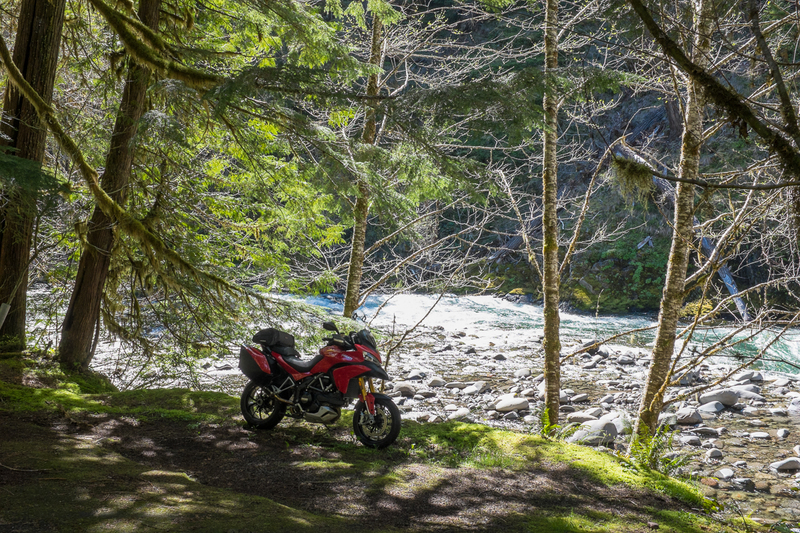 I just wish I could have parked the bike in the scene like I usually do. I had a GREAT (and huge) barbecue dinner in Page at Big Johns Texas BBQ, which Id read about on Yelp, and highly recommend! Best BBQ Ive had since the last time I was in Austin. 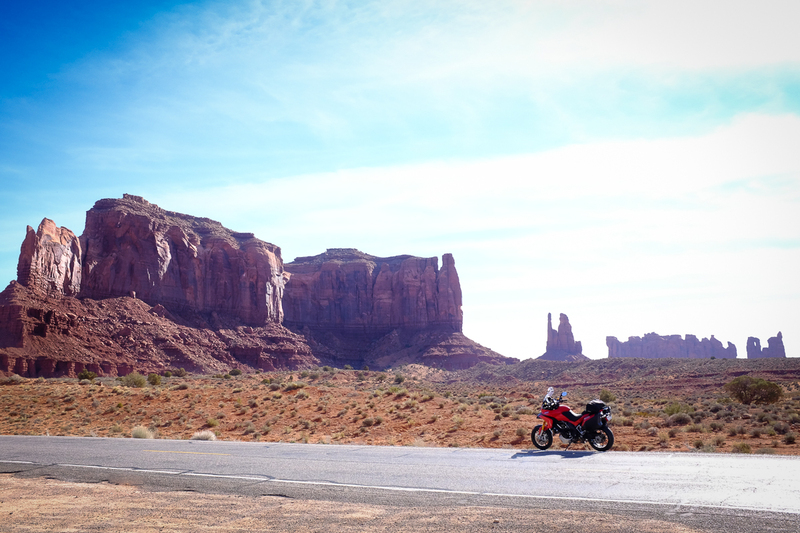 The next morning I got an early start, and headed toward a place Ive wanted to see for years  Monument Valley. Along the way I snapped a few early AM pics of the cool desert landscape. Monument Valley is completely classic and cool. Canyon walls at Horseshoe Bend and the Grand Canyon are pretty easy for me to understand. The river keeps eroding rock and soil away over time, digging deeper and deeper, creating canyon walls. 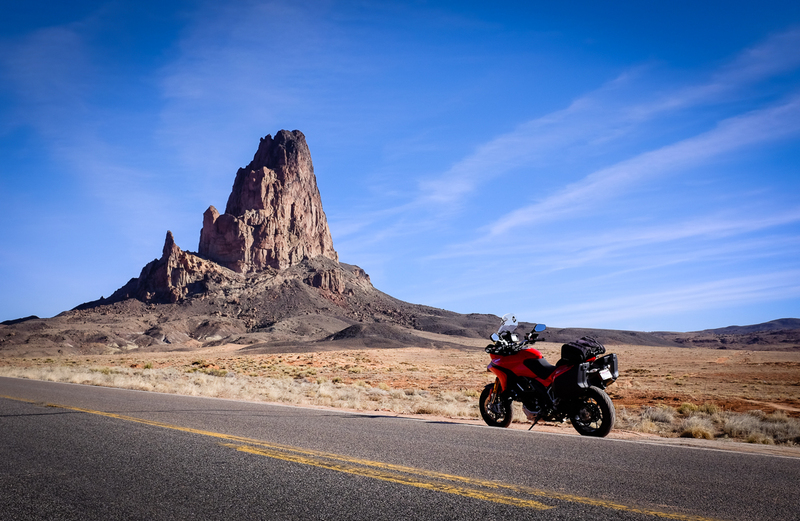 But how do these monuments of rock go straight vertical in the middle of the desert? Its just so unique to this part of the world, and really cool and special. 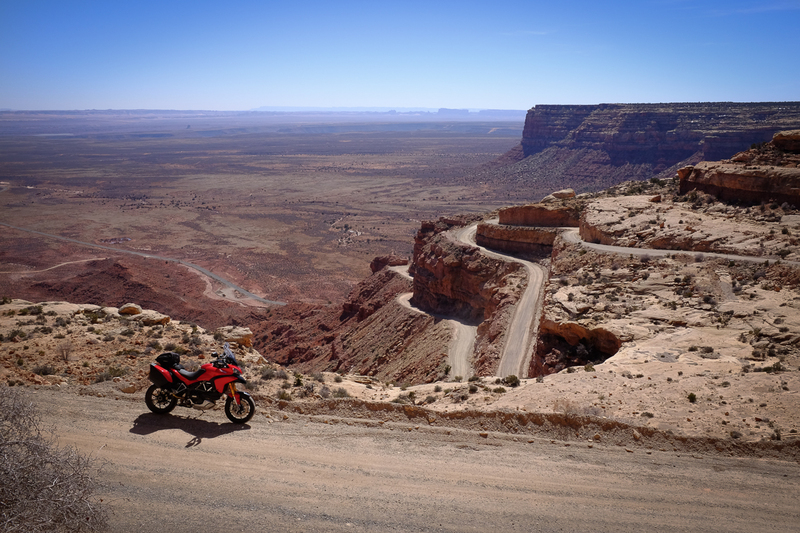 Next it was on to Mexican Hat, UT, and north to Natural Bridges. I had no idea what I was about to encounter. The highway headed straight into the side of the mountain, and it was unclear where it would go next. I found out. 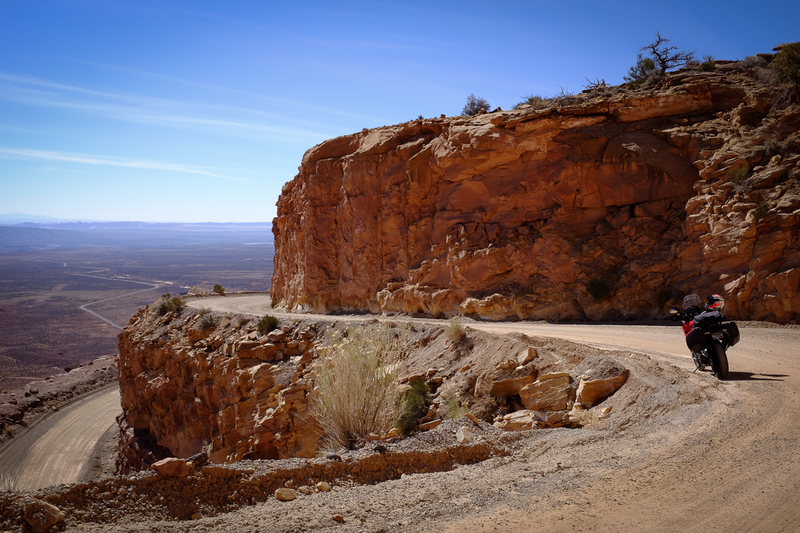 Pretty much straight up the side of the mountain, on a super-twisty, treacherous, and spectacularly scenic dirt and gravel road on the edge of cliffs. SO COOL! 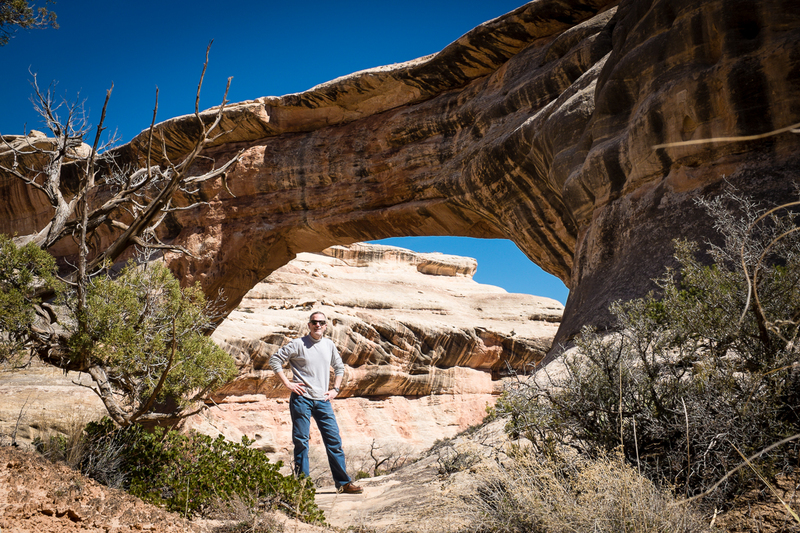 On to Bridges I went, and decided to do the hike down to the first of the three arch/bridges  called the Sipapu bridge. The hike is just over a mile down into the canyon, and its so steep that in a few places you use stairs or ladders to make your way down. Well worth the hike  just look at it! 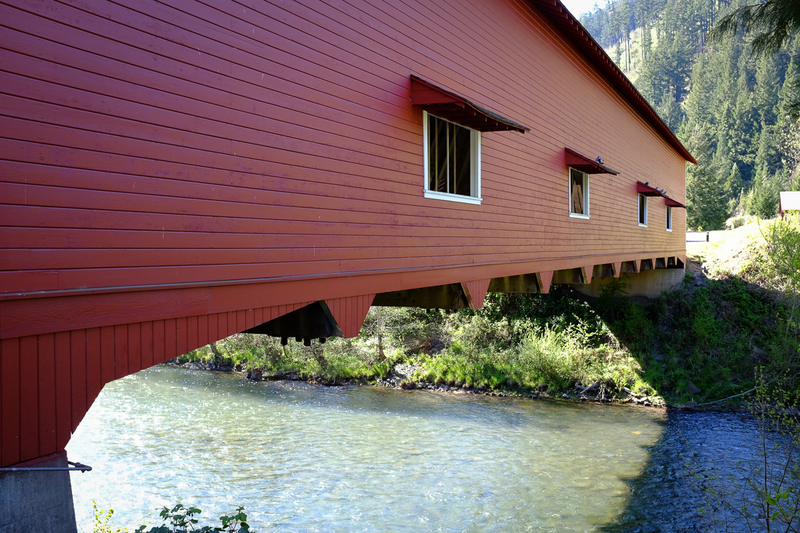 Its massive  220 feet high with a 260 foot span! So awesome. 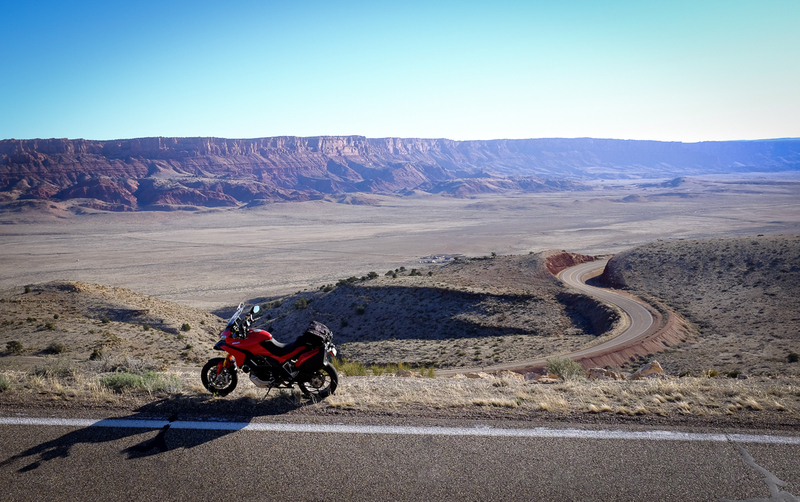 Back on the bike and off I went, returning to the cool twisty dirt road down the mountain toward Mexican Hat, where I made a much needed stop for fuel (for the bike and my stomach). Of course I had to grab a couple more shots of that view along the way. Usually I dont like to do out-and-back routes, preferring to do a loop so I dont traverse the same terrain twice. 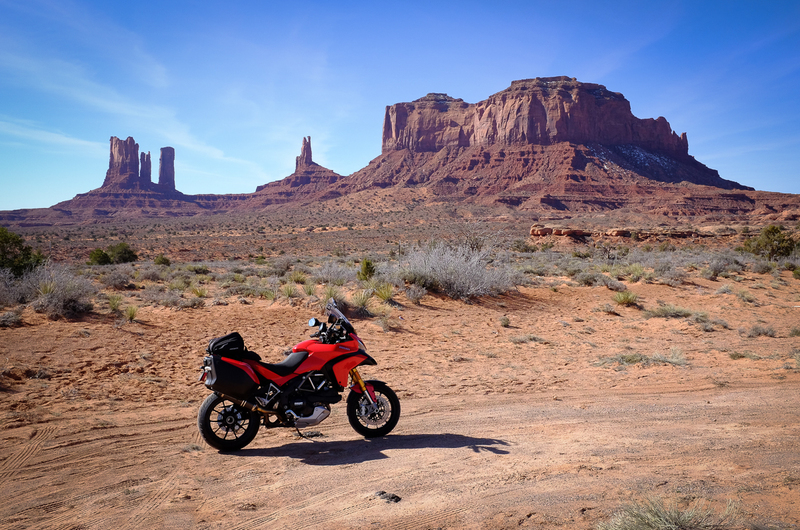 However, on this trip it was necessary  and it was also kind of cool from a photo perspective to see the landscape change with the light and shadows from morning to afternoon. So, of course a few more shots were required to capture how majestic this place is. 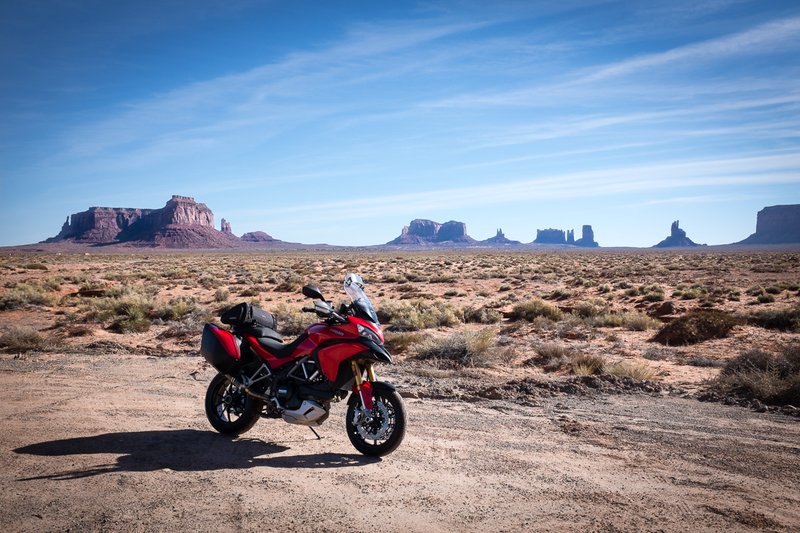 I rode on to my destination for the evening  the sleepy little Navajo town of Tuba City, AZ. Not much to do or eat there, but it worked, and I was ready for a rest. 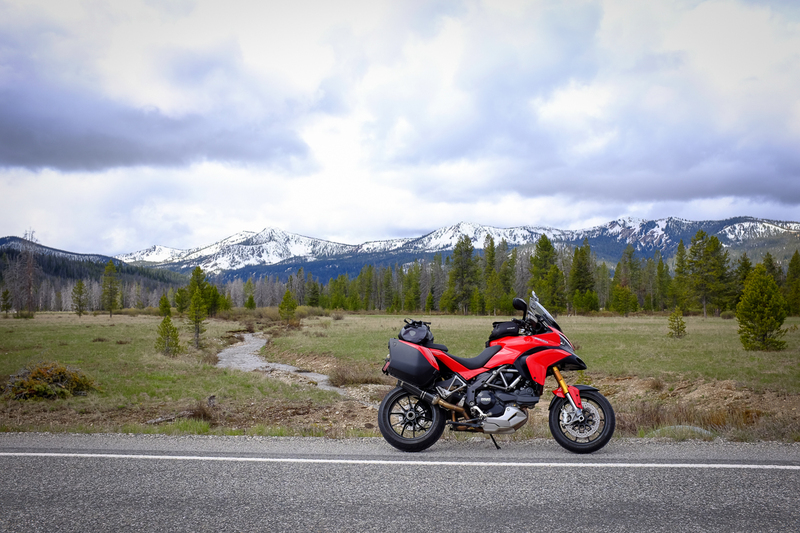 I wanted to get an early start Monday AM, since I knew I had four hours or so of riding, before loading back up in my truck and an 8 ½ hour drive back to home in Idaho. 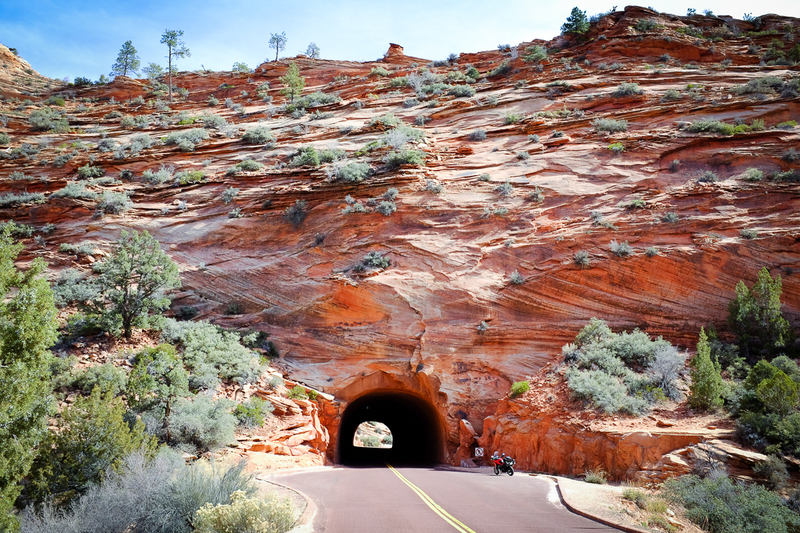 The main sight along the final route was Vermillion Cliffs National Monument, which was another amazingly beautiful stretch. 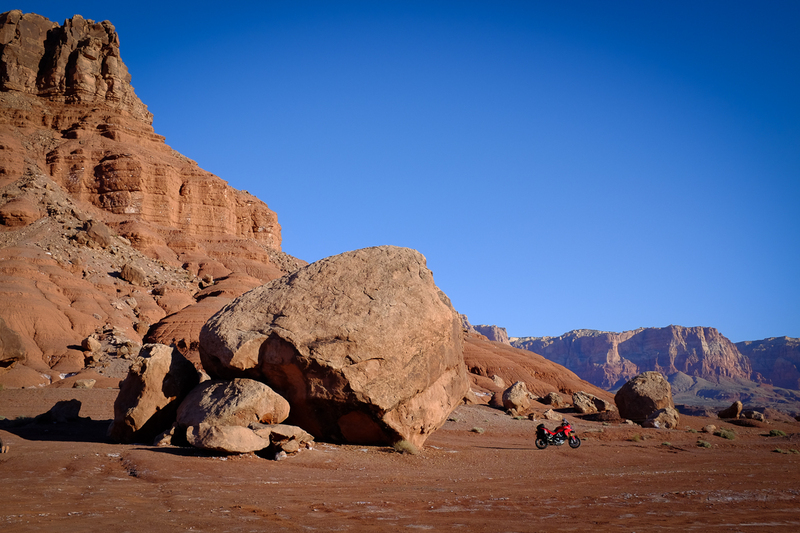 You get a sense for how big those boulders are when you see how little my bike is in this pic! 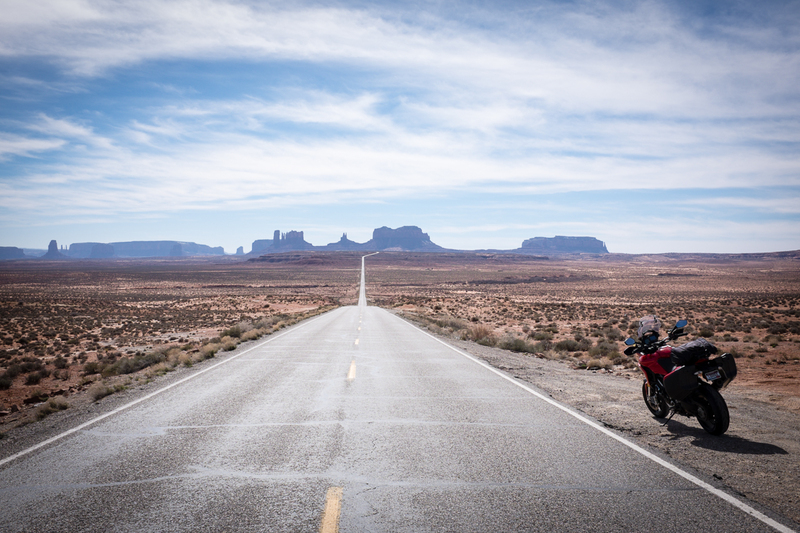 Much of the trip was riding long stretches of straight, flat, fairly nondescript desert between sites of mind-blowing spectacular scenery. 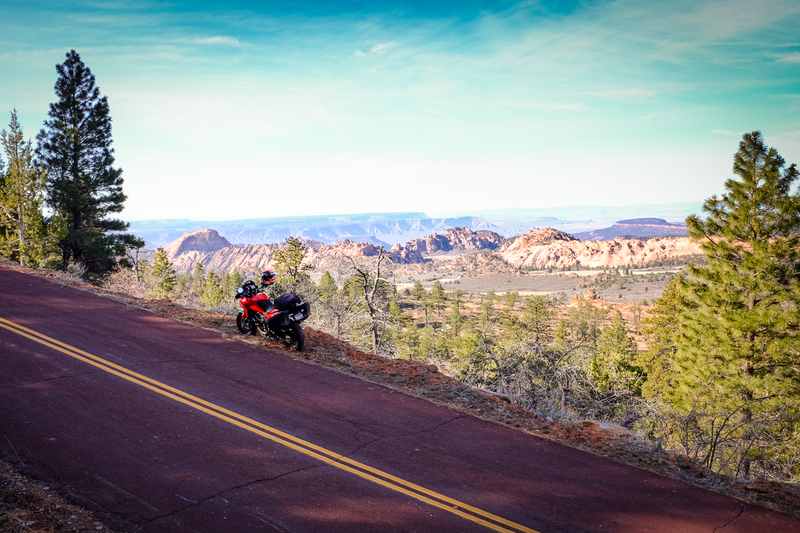 The final route along Hwy 89A was no exception, including a stretch of road that was one of the longest, straightest roads Ive ever seen. However, at the end of it, was the best stretch of twisty mountain roads on the whole trip! 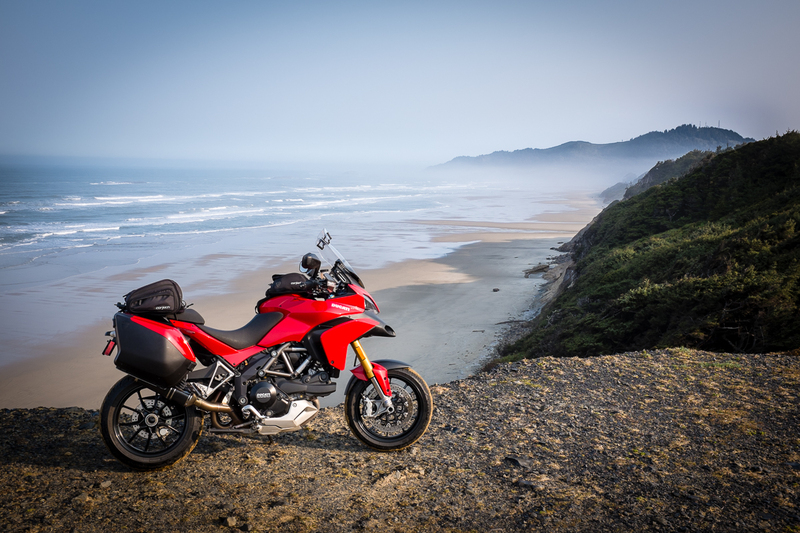 Finally had a good reason to switch the Multistrada from Touring mode to Sport mode. 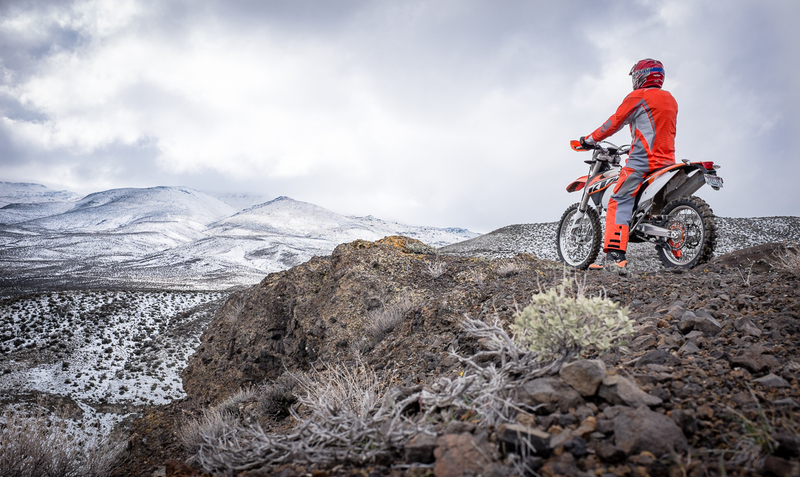 Road was empty, grip was good, and it was awesome to have a little fun on the edges of the tires. As I got toward the top, I found that despite the warmer temps weve been having, it was still indeed winter up there! 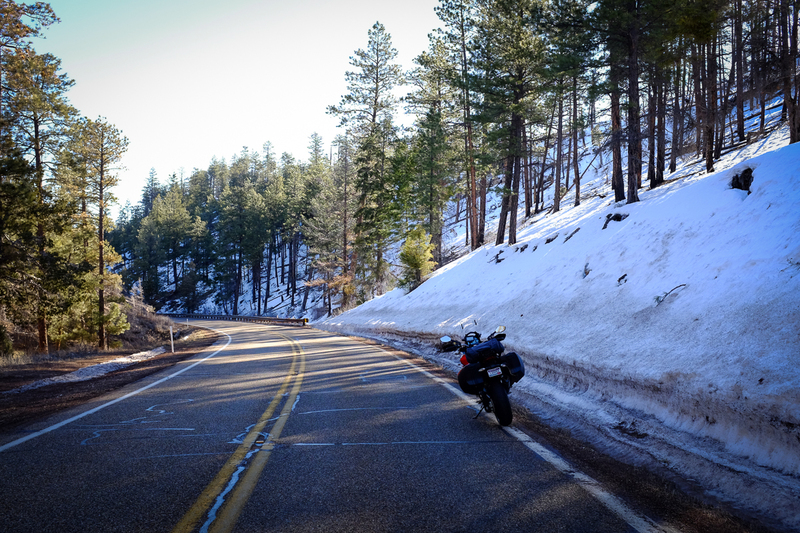 I was hoping I might be able to take Hwy 67 down to the north edge of the Grand Canyon, as that is supposed to be a really great road for motorcycling, but alas, it was closed for winter. Oh well, I sure cant complain. 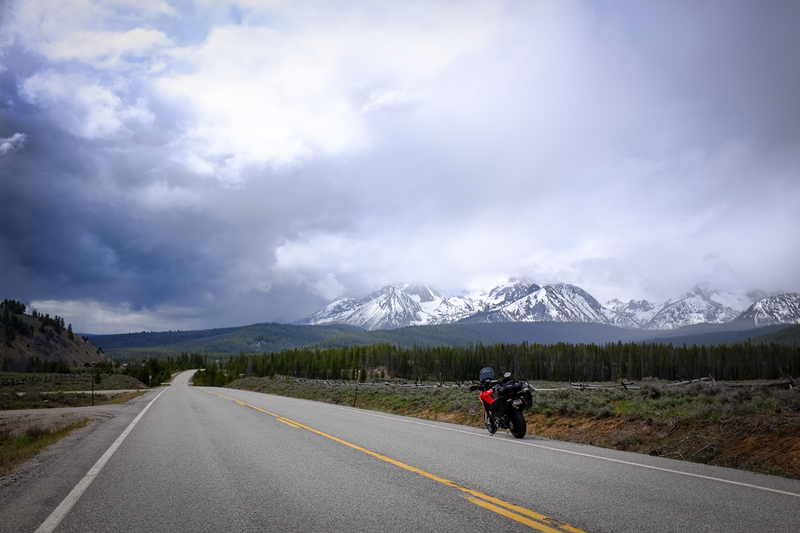 It was a completely fantastic 2 ½ days, 840 miles of riding therapy, and sights Ill never forget. Very grateful! Ryephile, The Virginian, Project Mayhem and 15 others like this. 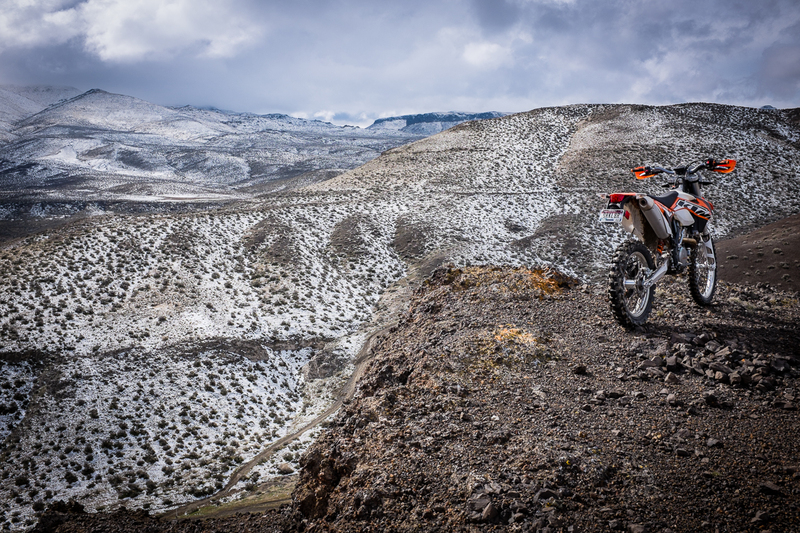 Awesome ride and pics Thanks for sharing! JonnyN Thanks for the ride! 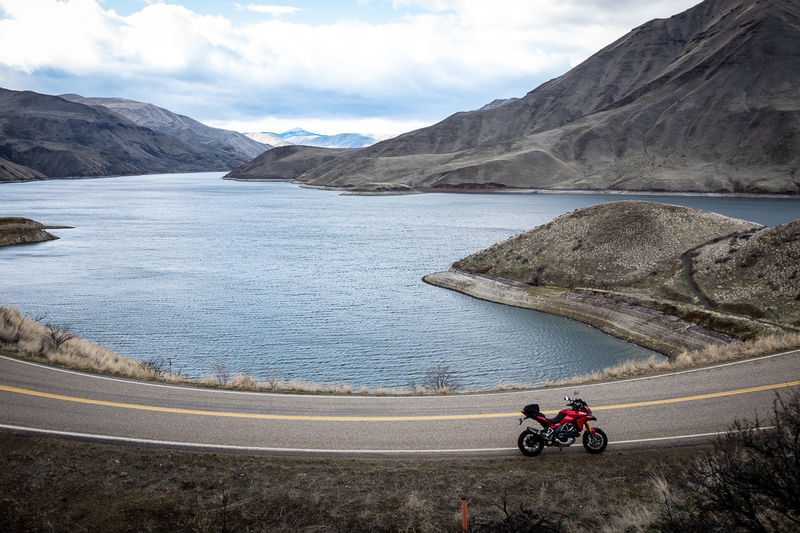 Thanks for sharing and for reminding me how much I wish I lived accross the pond in the US/Canada where you have this kind of scenery for miles and miles. The weather here has been ridiculously warm in February and March (sorry, New Englanders). 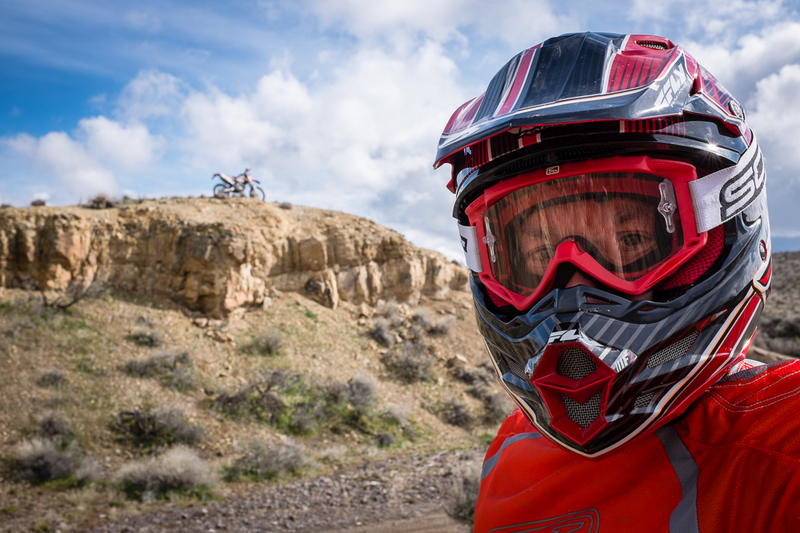 Normally I'd be snowboarding this time of year, but when there is crappy snow and it's going to be in the 60's, I've got to get out and play on the bikes, after several months of hibernation. 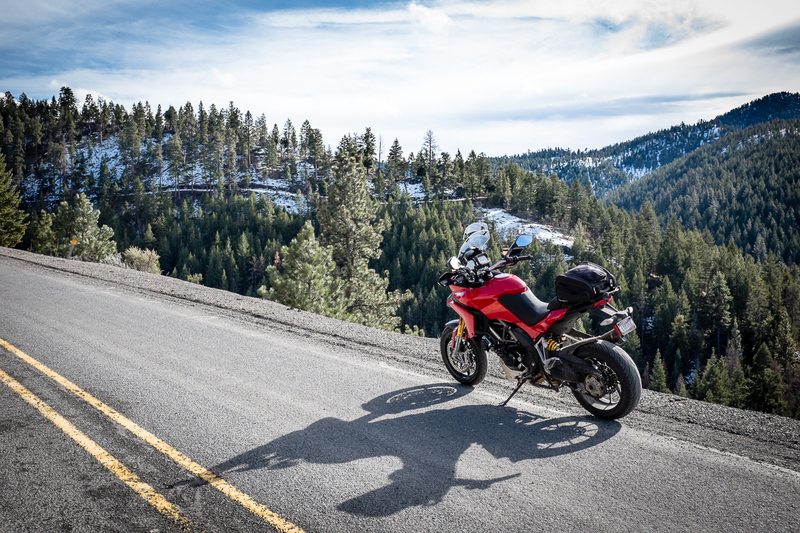 A great way to start the new riding season! The Virginian, mischief, Pohaku Rider and 4 others like this. 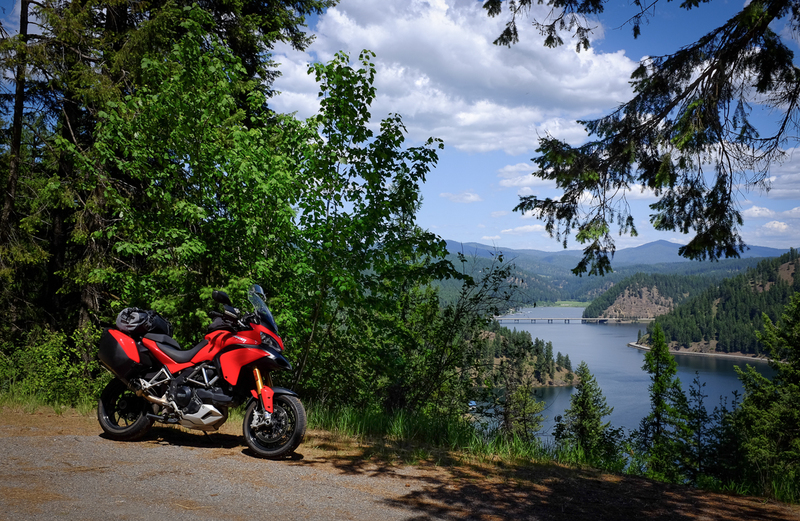 The Multistrada has been doing a fantastic job of taking me to spectacular places all over the northwest, since bringing her home four years ago. Ive never owned a bike this long, put this many miles on it, and had so many fun and memorable experiences. 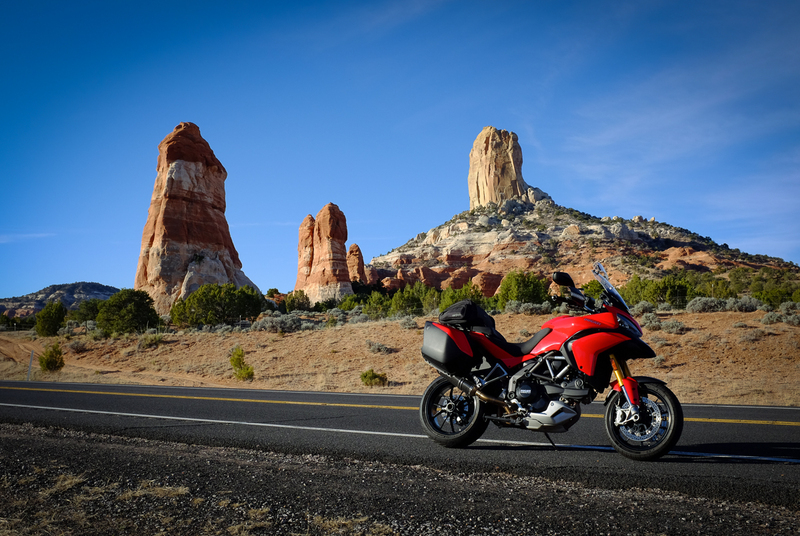 However, as great as the bike is, it is certainly more suited to asphalt touring than dirt. 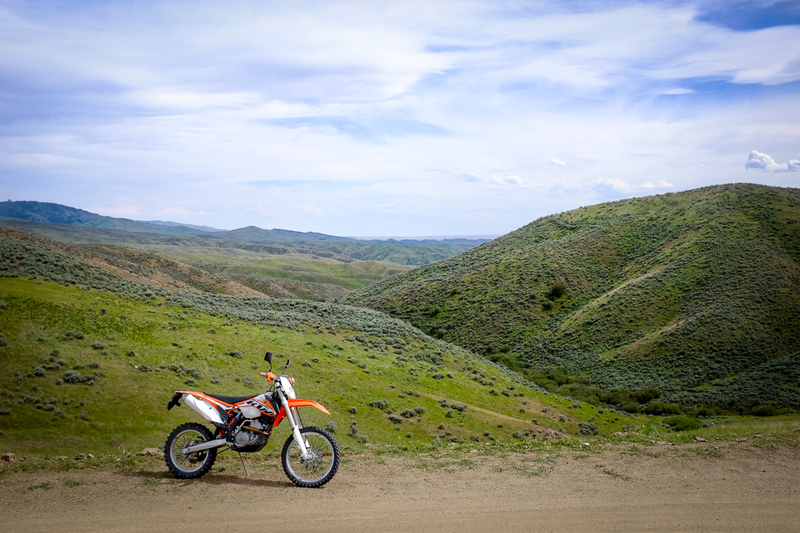 And Idaho (and the surrounding states) have a zillion miles of incredible dirt roads and trails that Ive been wanting to explore (and photograph). 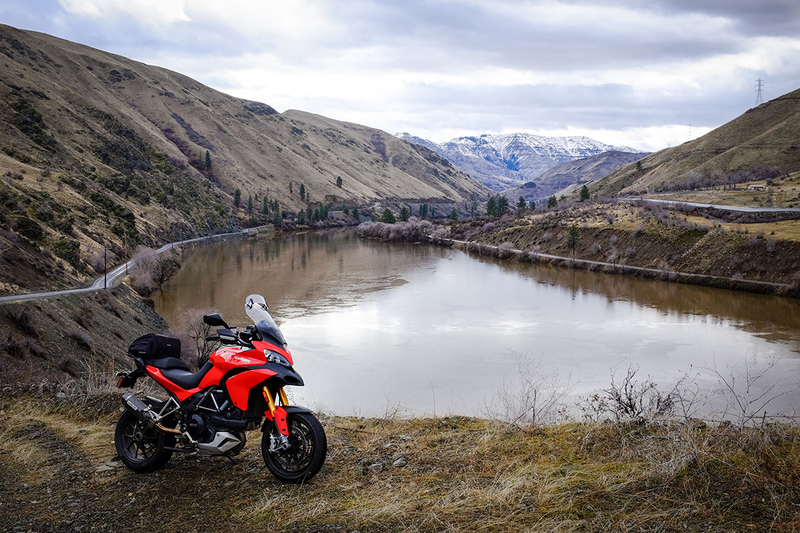 Thanks to my great friend Rand, a KTM rep, I now have a stablemate for the Ducati, which will open up way more opportunities for me to explore the beauty of the northwest. 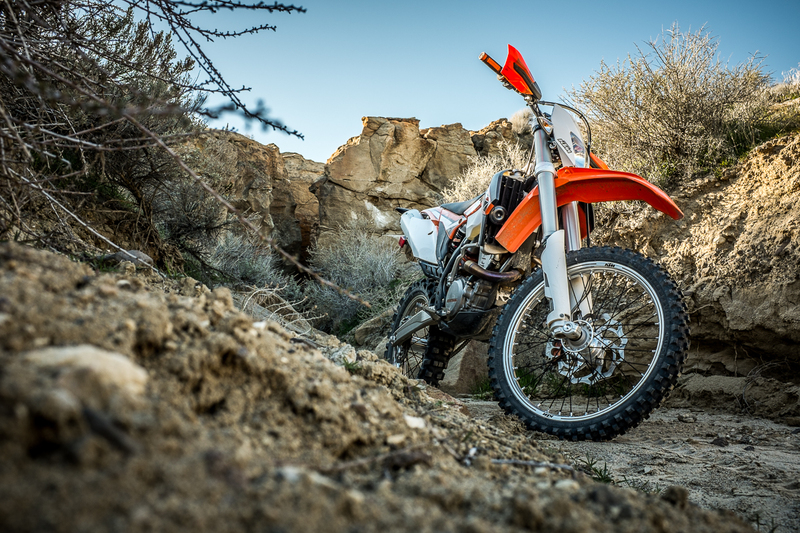 Its a 2014 350 EXC  and its quite awesome. 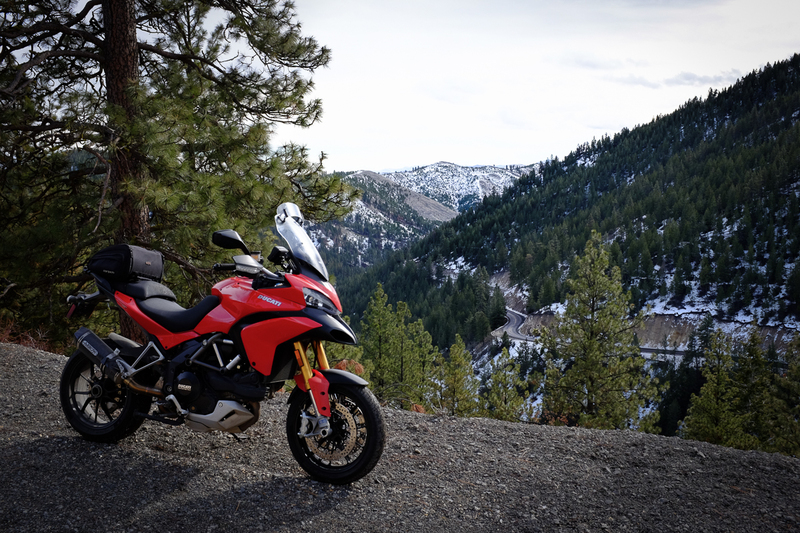 Ive been riding it as much as I could the last few weekends, which is somewhat surprising given the fact that this has been in February and early March, when one wouldnt normally be expecting to do a lot of riding in this area. But, thanks to some unseasonably warm and dry weather, its been cool but really fun! 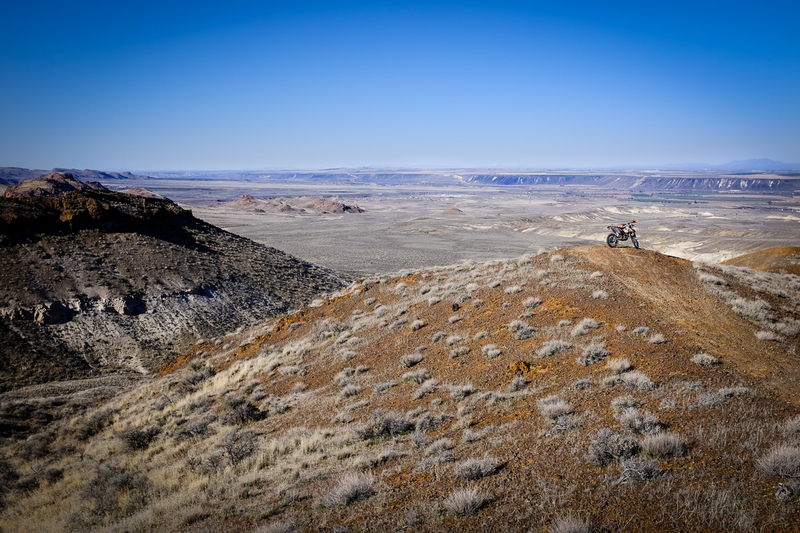 Mostly Ive been exploring the Hemingway Butte area, which is a massive off-road vehicle park, open to the public, about 40 miles from where I live, out toward the Owyhee Mountain range. 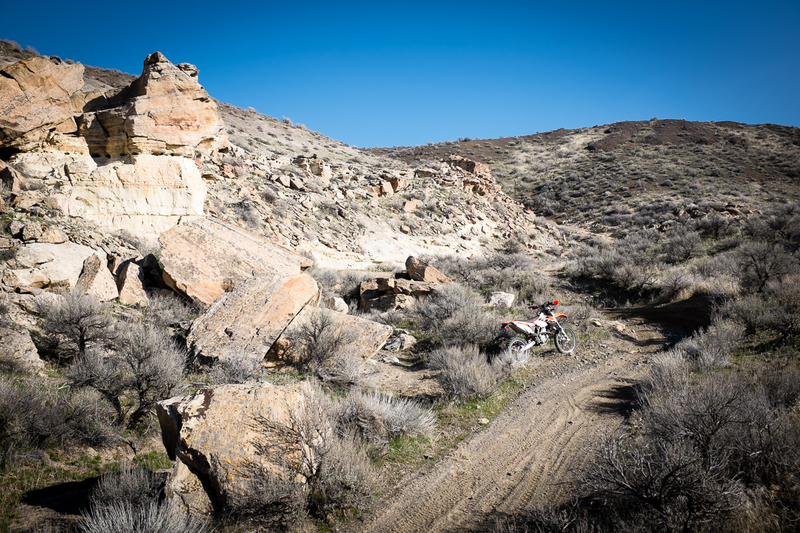 Its an amazing place, just huge, with an incredible diversity of terrain, beautiful scenery, and hundreds and hundreds of miles of trails. I get lost out there! 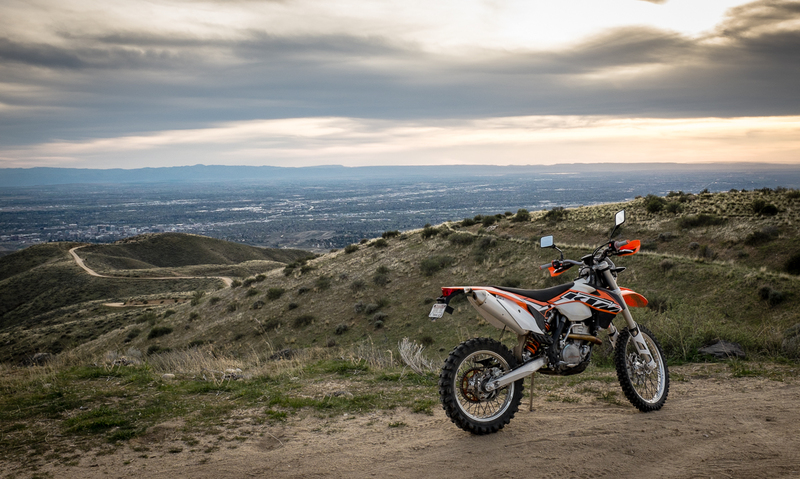 Im super stoked about the adventures that await me this season on the new bike! 65matt, Meriwether, Pohaku Rider and 5 others like this. Been busy working the last couple of weeks so haven't been able to get out on the bikes the way I'd like to. Yesterday was a near-record 77 degrees here (! 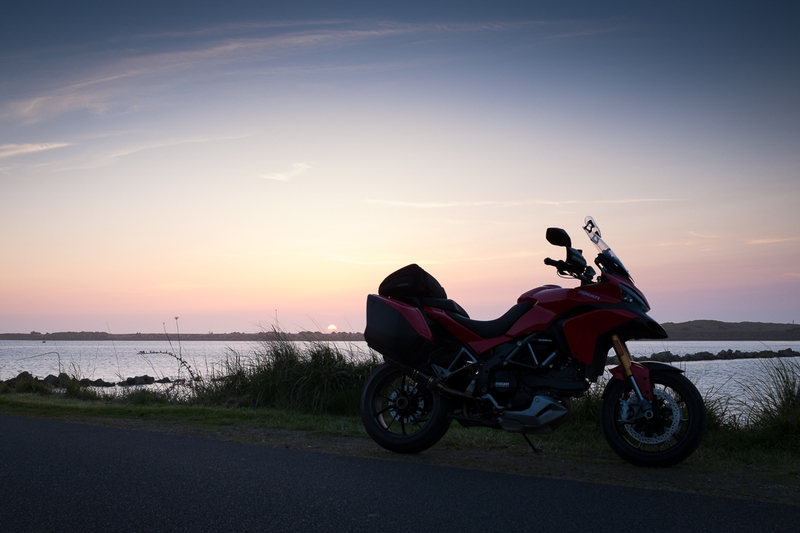 ), so after work I just had to go twist the throttle. 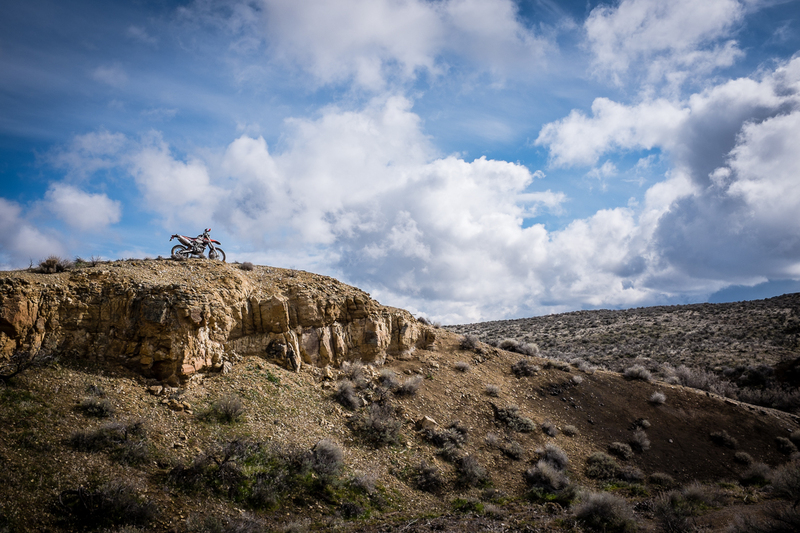 We're really fortunate to have riding like this just a few miles from downtown Boise! 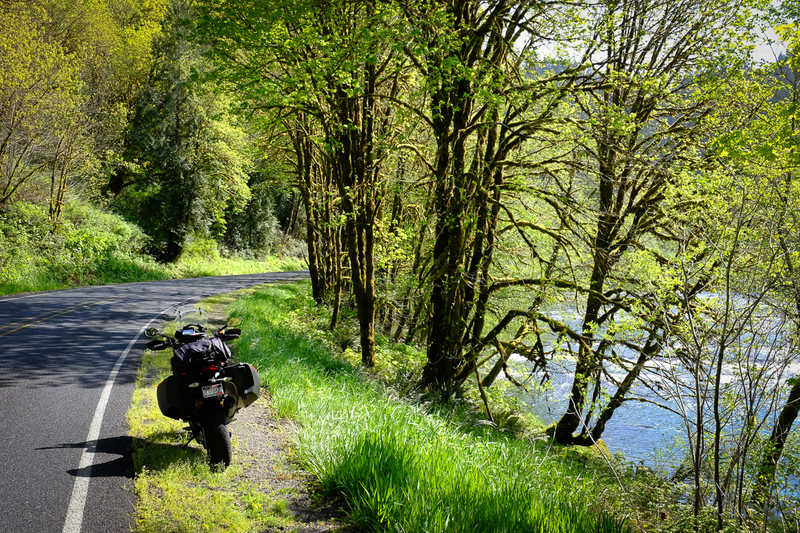 Meriwether, Dirtbauer and BackRoadNomad like this. 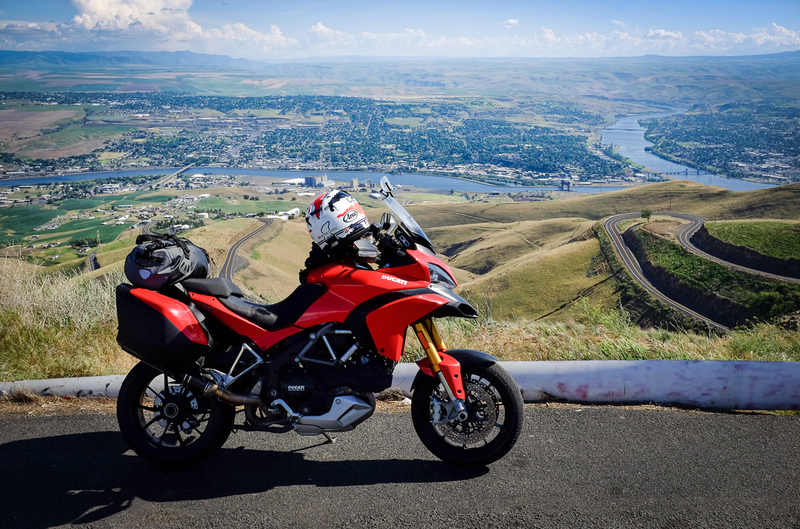 The last four weeks at work have been super intense, with long hours and weekends spent at the office  so I was really itching to get back out on my Ducati for a road trip. 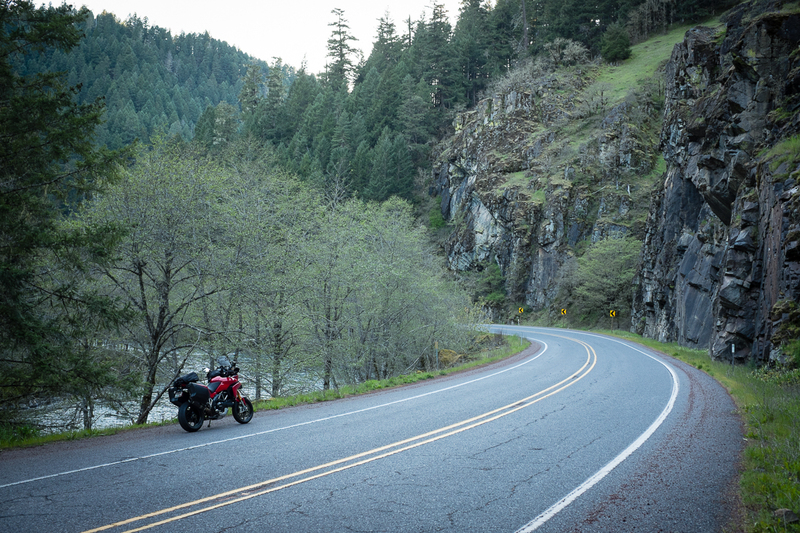 Ive been wanting to get back to Oregon for a ride, as there are so many fantastic roads over there. 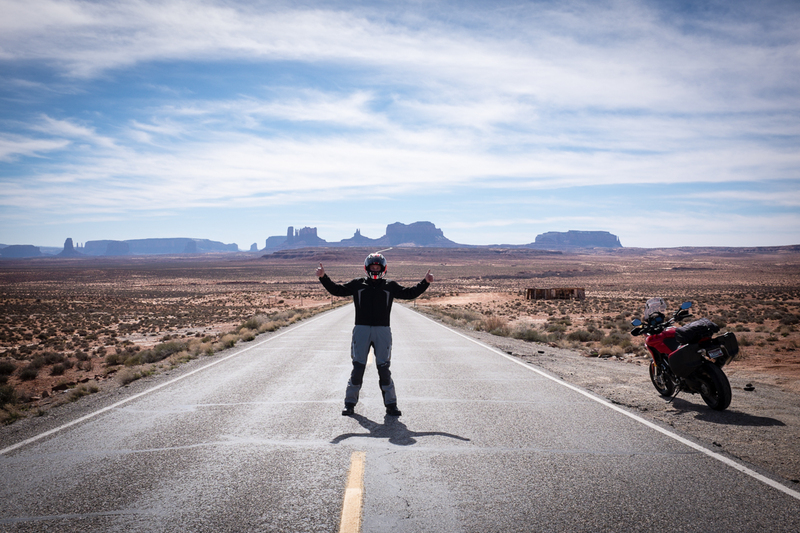 It would have been easy to hop on the bike and ride on a bunch of the ones Ive already done, but I was ready to make the trip a little more ambitious and stretch over to parts of the state I hadn't yet seen. I put together a nearly 1,000 mile route that would have me start and end in Bend, which is about 5 ½ hours from home here near Boise. 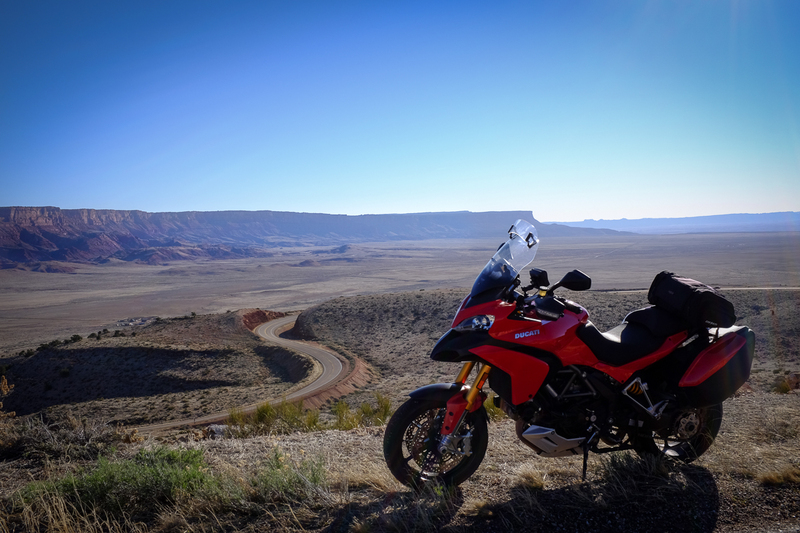 I figured Id do as I did with my Utah trips, drive through the boring open desert parts between my home and there, at night or early AM, in my pickup with the bike in the bed. 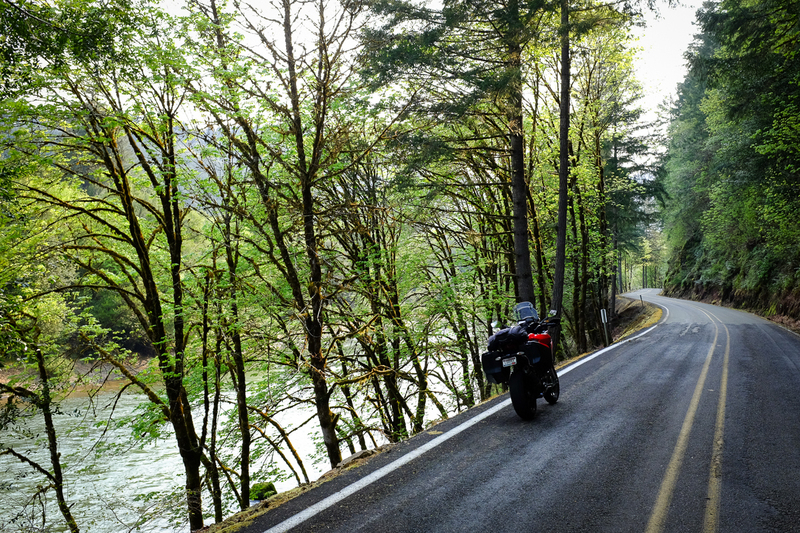 The route would wind through some very twisty and scenic roads, through some pretty remote forests and along rivers and lakes, and also take me along the Pacific coast as well, which was pretty exciting, as Ive only been over that way once before, for just an hour or two on a short ride last Fall. 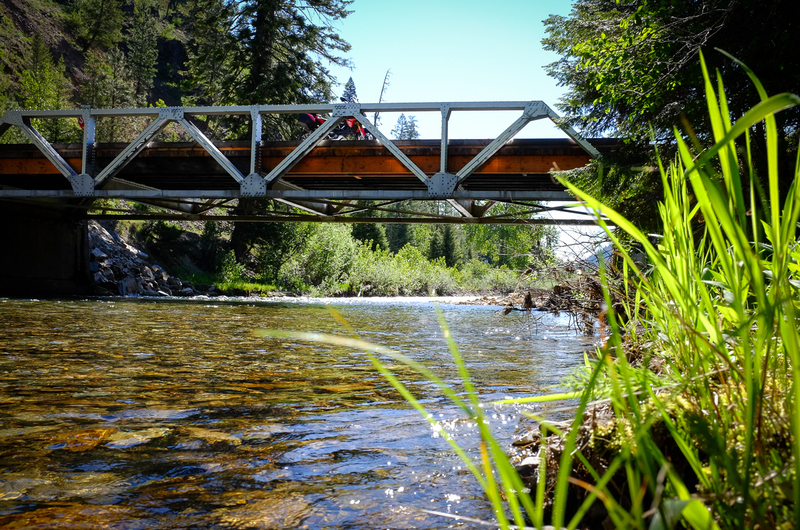 I unloaded the bike in Bend at around noon, then loaded up and set off on my ride. I stopped in the cute little touristy town of Sisters for a nice lunch at a café there. 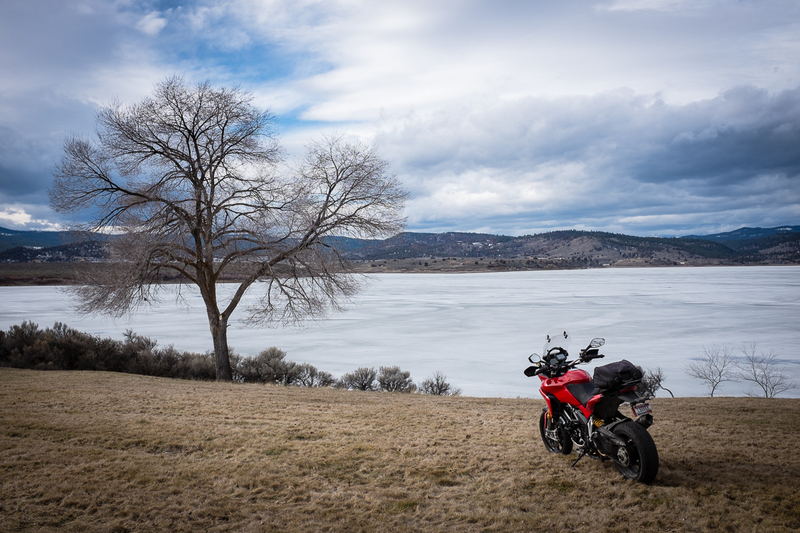 The first place I stopped for photos was above Cougar Reservoir. As you can see, it was a beautiful day! Right around 70 degrees  especially nice for April. Aufderheide Road/N.F 19 went on forever! 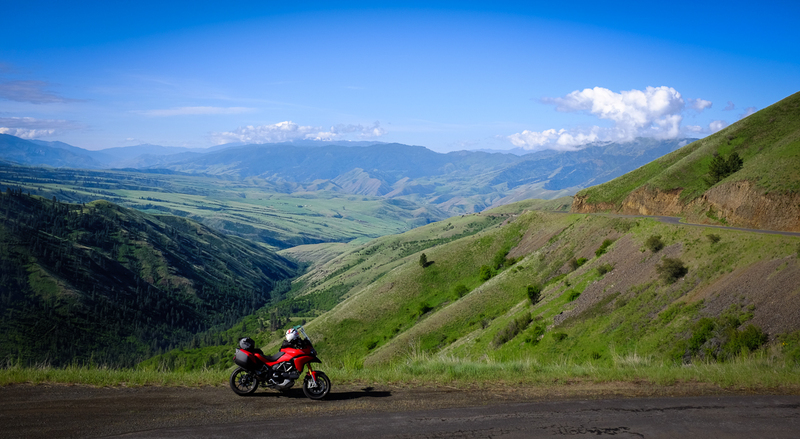 It was quite beautiful and remote, I rarely saw another person or bike along the way. The sun blasting through the trees made visibility pretty challenging, because of the constant high contrast between sunlight and shadows. 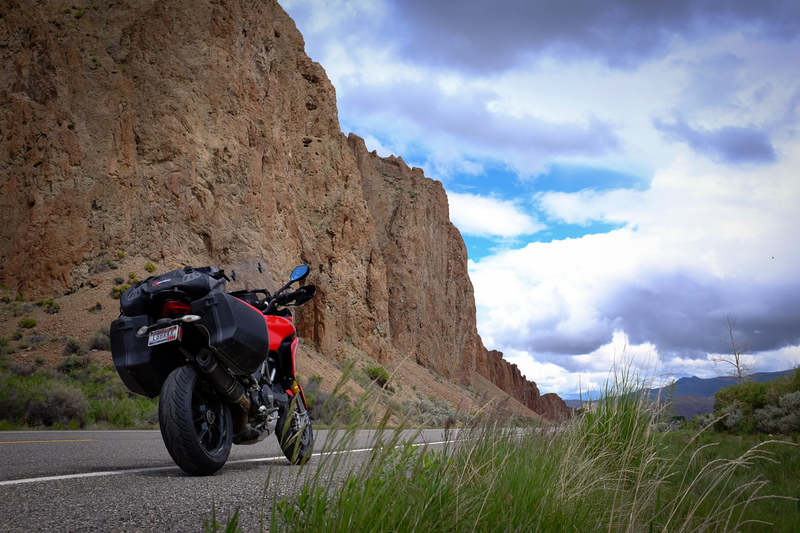 It felt good to get back to the highway and be able to open up the throttle a bit and see better. 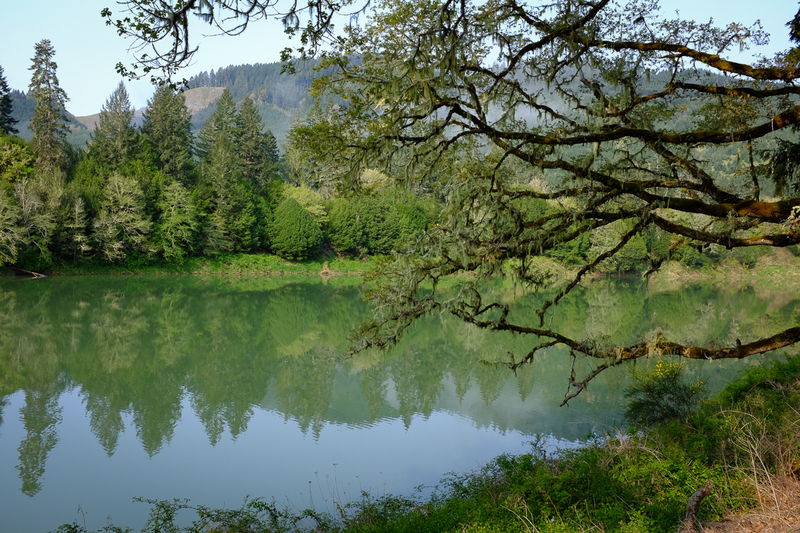 The real highlight of the day was the stretch of Hwy 138 between Diamond Lake and the little town of Glide. Fast, twisty and fun! 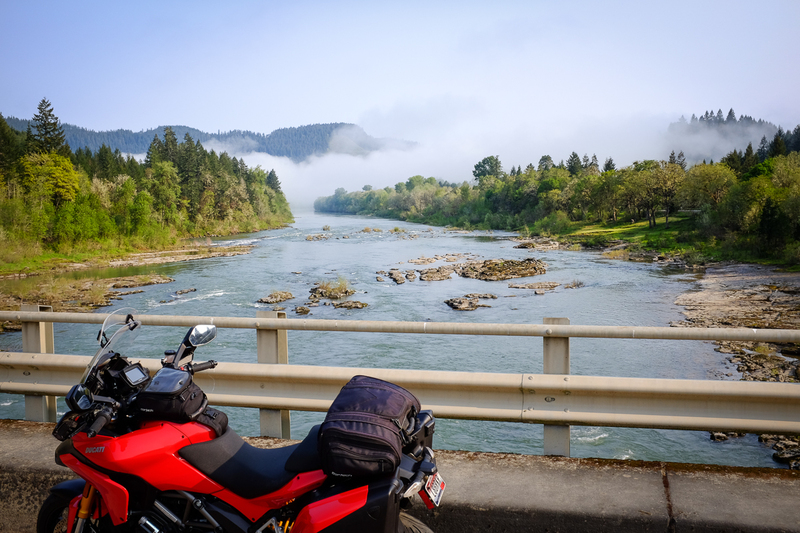 Sunlight was falling fast due to my late start, but I got to my evening destination of Roseburg just before dark and checked in to the hotel. I found a great burrito place across the freeway from my hotel (Burrito Vaquero), and had a nice big Pollo Asada burrito for dinner, which really hit the spot. Nice little old lady making the tortillas by hand! 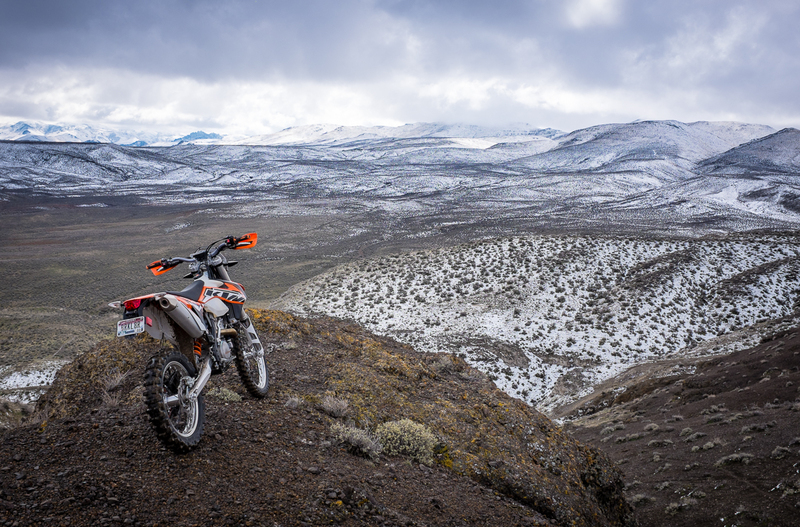 Day two was quite simply one of the best days of riding Ive ever experienced. Ever. 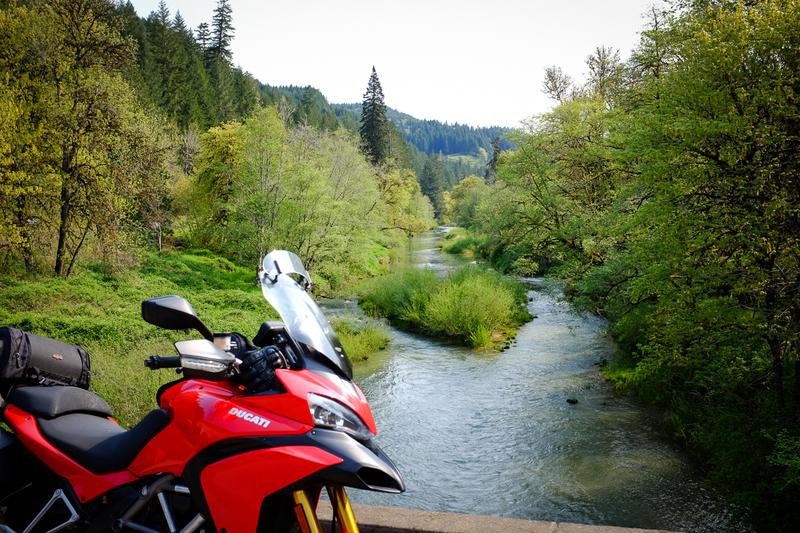 I left the hotel early and headed over to Tyee Road near Umpqua, which was absolutely beautiful. And empty. What a great way to start the day! 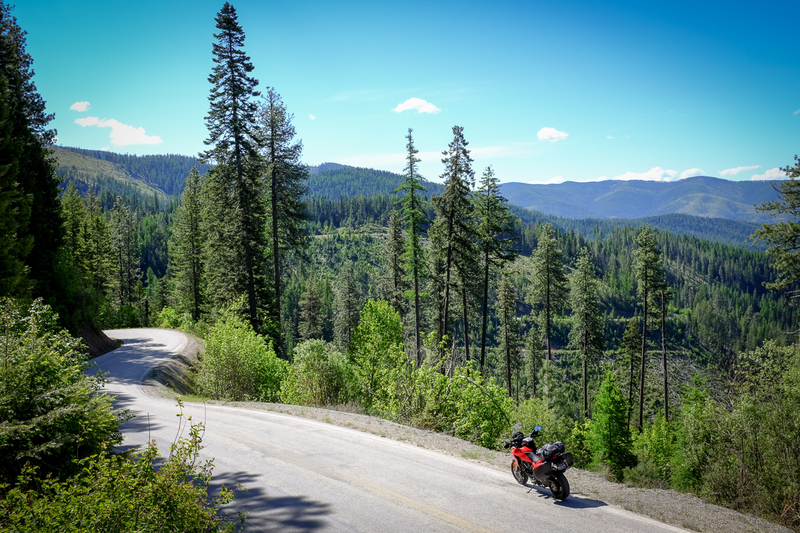 I stopped for fuel in the little town of Drain, and headed over to another INCREDIBLE road  the Upper Smith River road, which climbed a big hill with all sorts of twists and turns and dips and hairpins. Just awesome! So much fun. And some great views at the top! 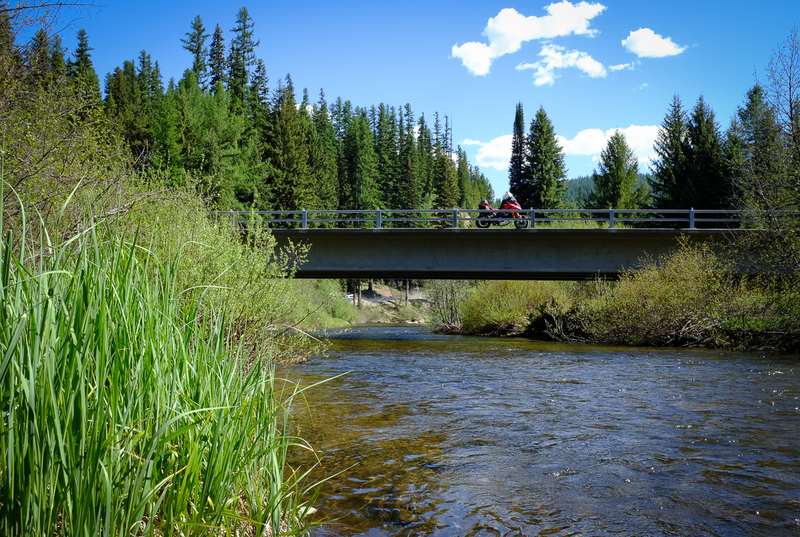 According to my Google map, the Upper Smith River Road, and Lower Smith River Road, are connected. 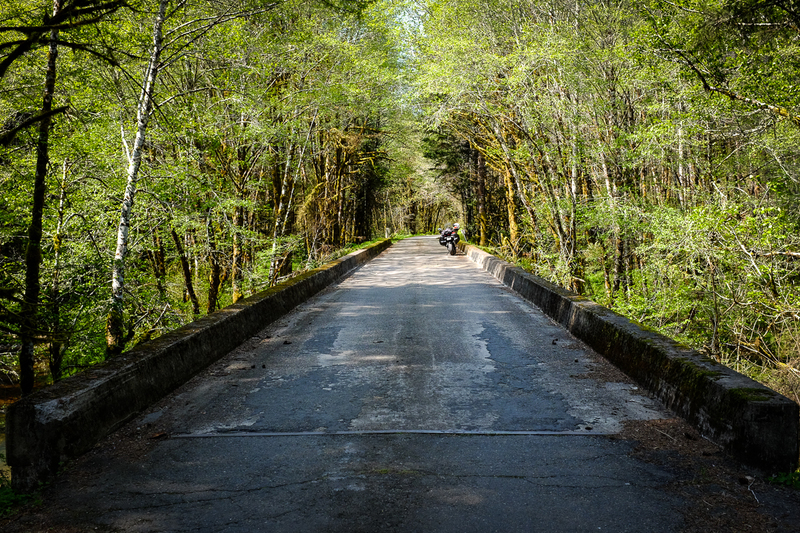 The total length of the combined road is about 75 miles long, through some extremely lush, remote, dense, deserted forest. However, my new TomTom GPS unit didnt see things that way. It was showing a big gap between Upper and Lower, so about 20 miles in it kept telling me Turn around when possible. Again, and again, and again. 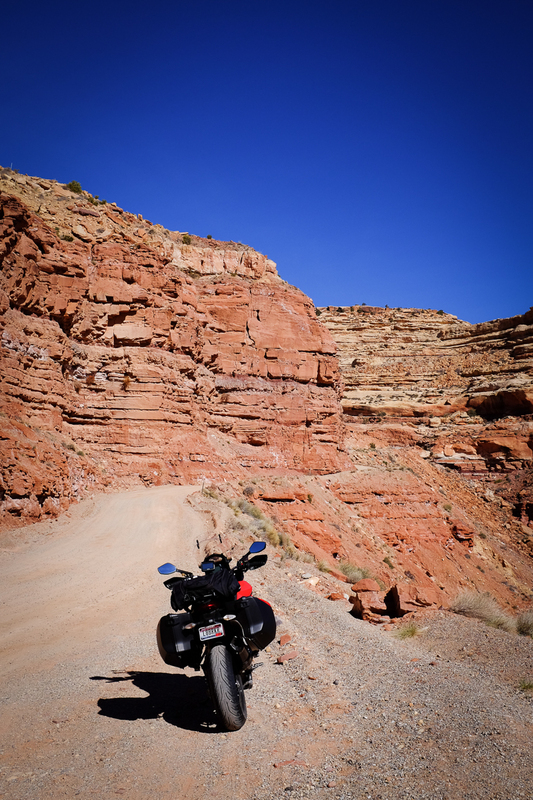 All this while on a somewhat rugged road, with ZERO people or vehicles around of any sort. I was really hoping I wasnt going to hit some roadblock or find that the GPS was correct, only to have to turn around and go all the way back. I was also telling myself that this would be a really bad place to break down or crash. The road kept going, and going, and going. 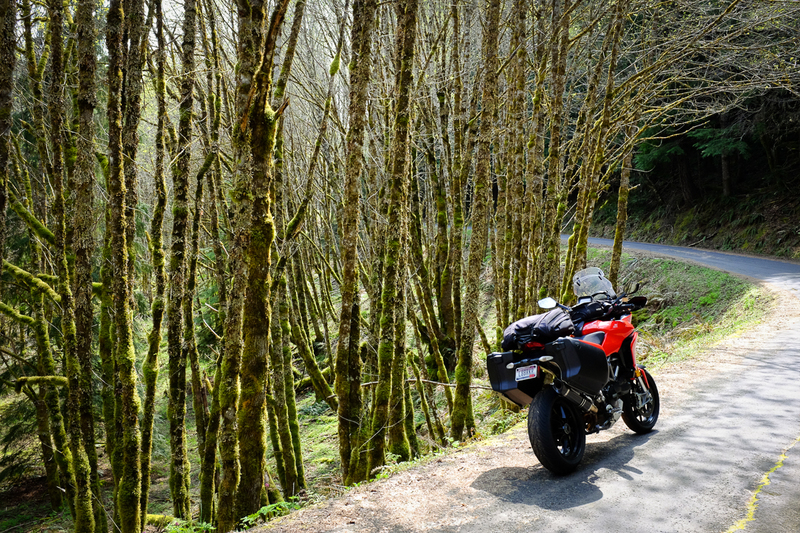 All the while, the GPS kept saying Turn around when possible. But, I kept going. And Im sure glad I did, because finally the road got wider, and smoother, and even more beautiful. 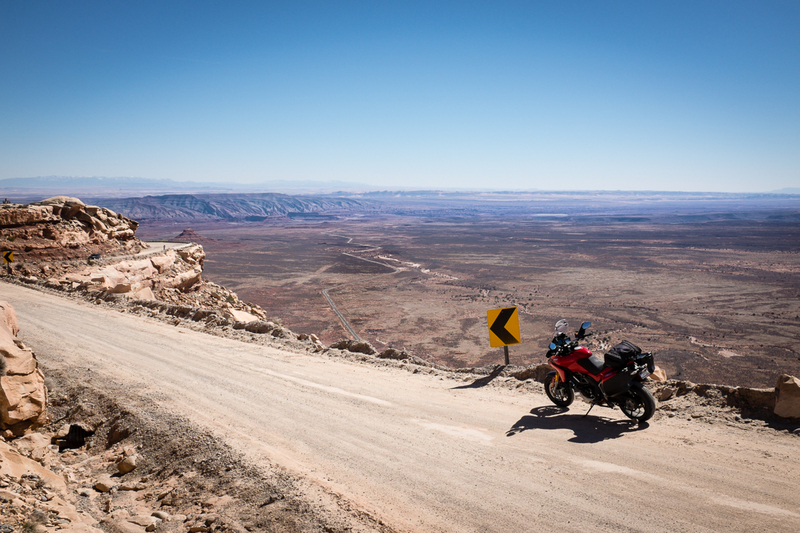 An absolutely epic road. 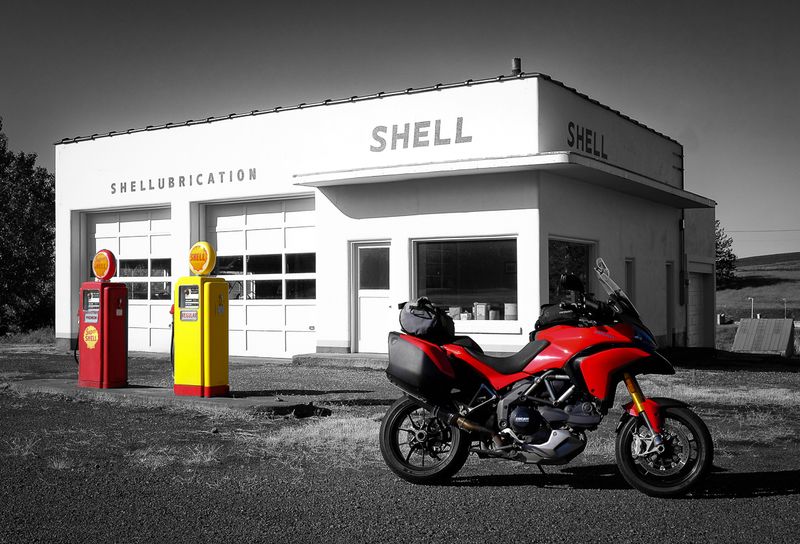 Finally I reached the end, and headed toward the coastal town of Florence, where I stopped for a late lunch. 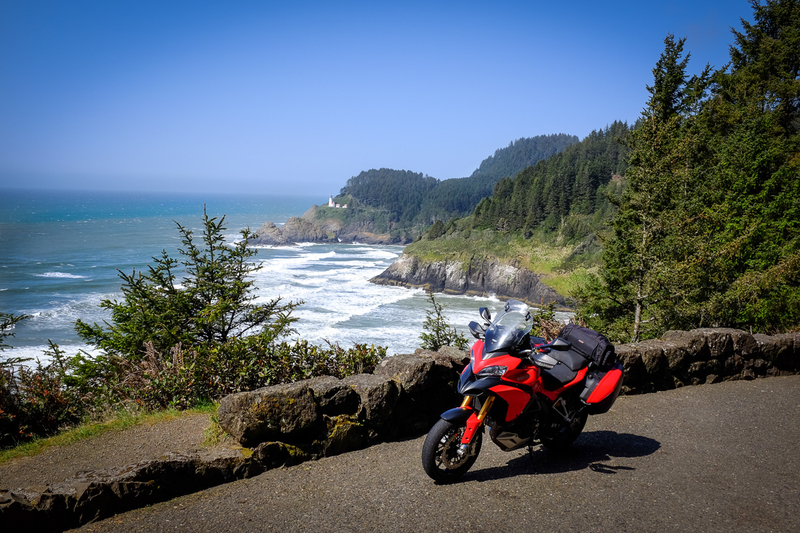 Next I headed north along Hwy 101, and the ocean views became spectacular! It was cool and breezy, but pretty darn nice for April. 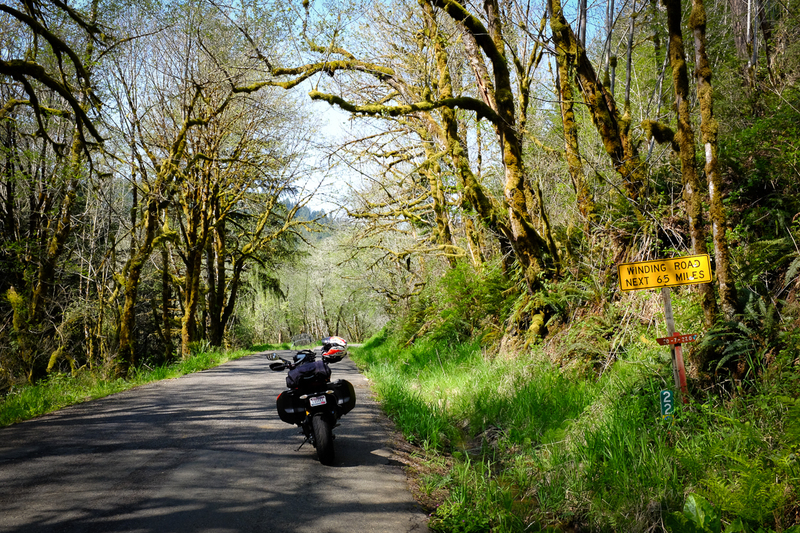 I continued north to Waldport, and then turned east and headed back inland to go check out some more cool roads. 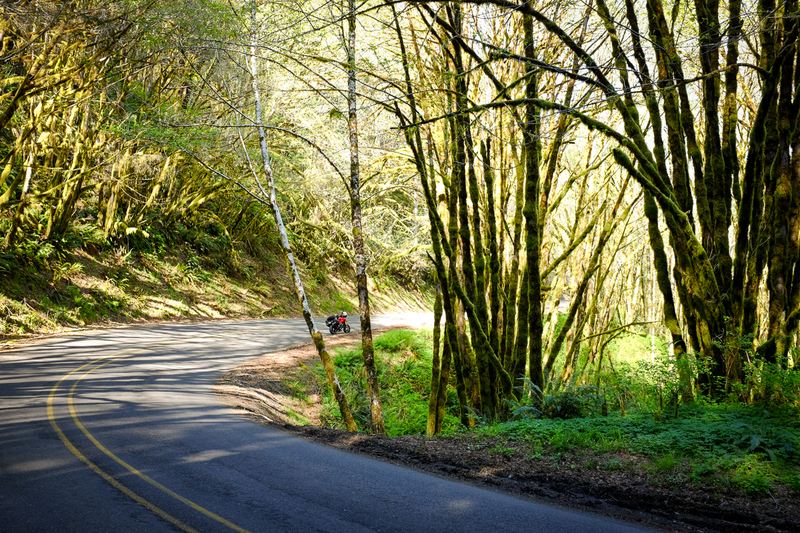 One nice little longcut I made along the way was Lobster Valley Road and Alsea-Deadwood Highway. SO MUCH FUN! 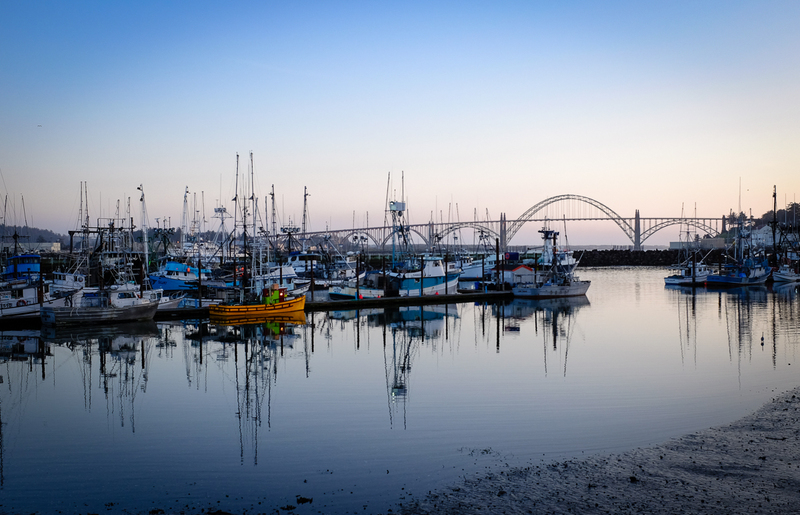 I gassed up in Philomath and headed west again, to spend the night in Newport on the coast. Along the way I mistakenly thought the GPS was forgetting a little twisty detour I wanted to try (I was confusing this part of the trip with another). 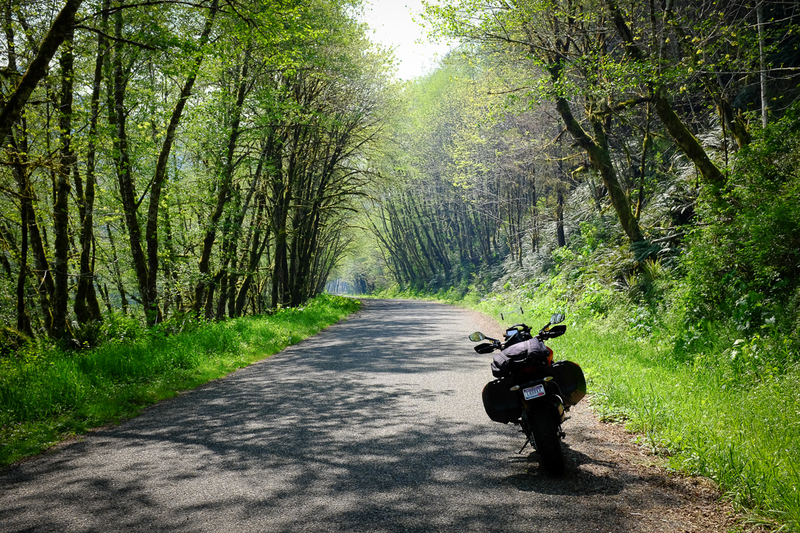 I stopped and looked at the map, and said there it is, and took a detour I hadnt planned  that turned out to be an amazing little road! 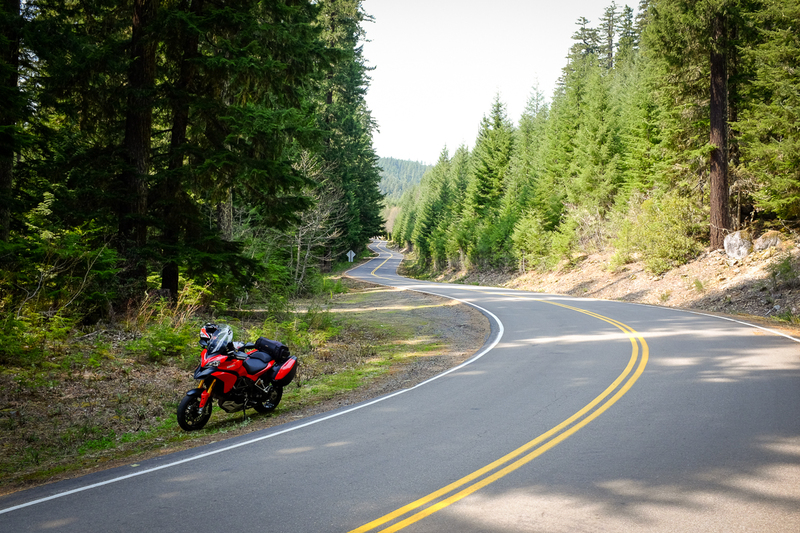 Its Hwy 180  the Summit Highway/Nashville Road loop off of Hwy 20. 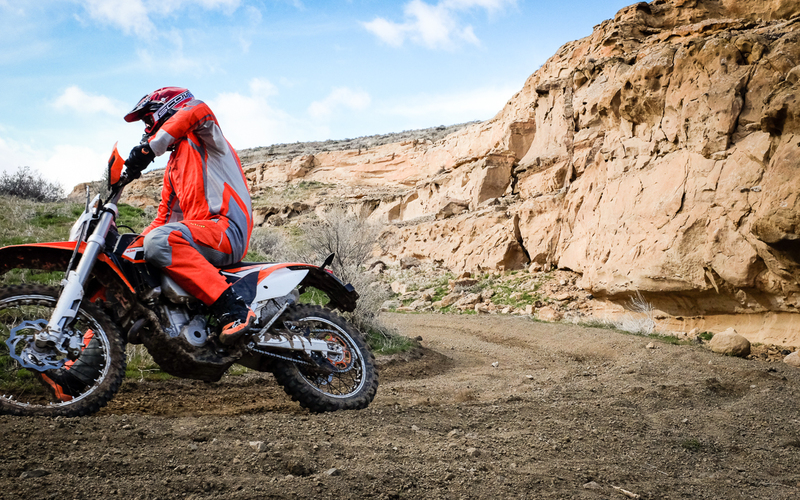 Just fantastic  snaking back and forth across railroad tracks along the way. 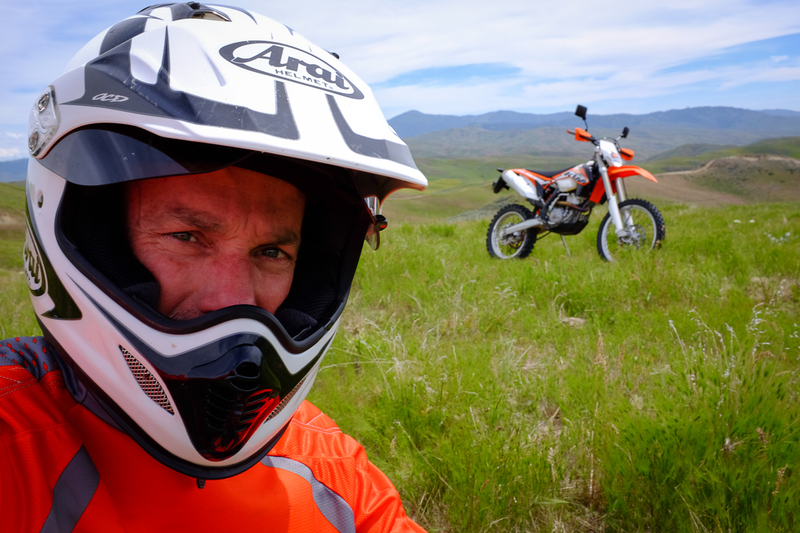 I really couldnt believe what an incredible, diverse day of riding that was. 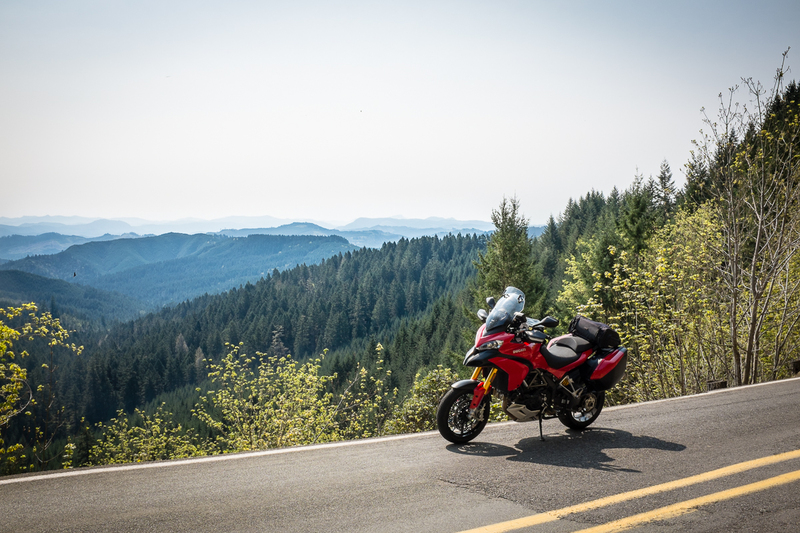 Around 340 miles of pure riding bliss. Lots of time on the sides and edges of the tires for sure! 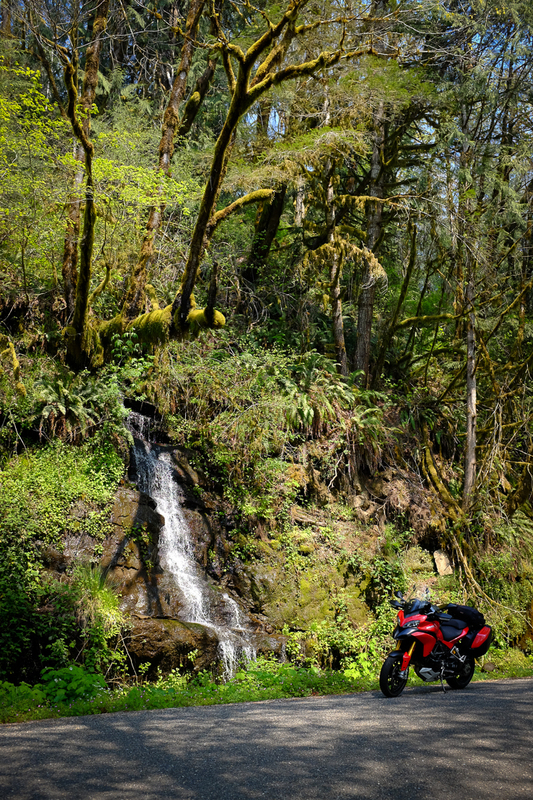 Remote forests, spectacular ocean views, roadside waterfalls. Maybe the best day of street riding ever, and Ive had some great ones. I checked in to the hotel, and had some great fish tacos with locally caught rockfish at Ocean Bleu in Newport. At sunset I saw this pretty view in the harbor by the restaurant. As I traveled back to the hotel over the bridge, I saw the sun was just about to completely set, so I pulled over by the bay and grabbed a photo (of course!). 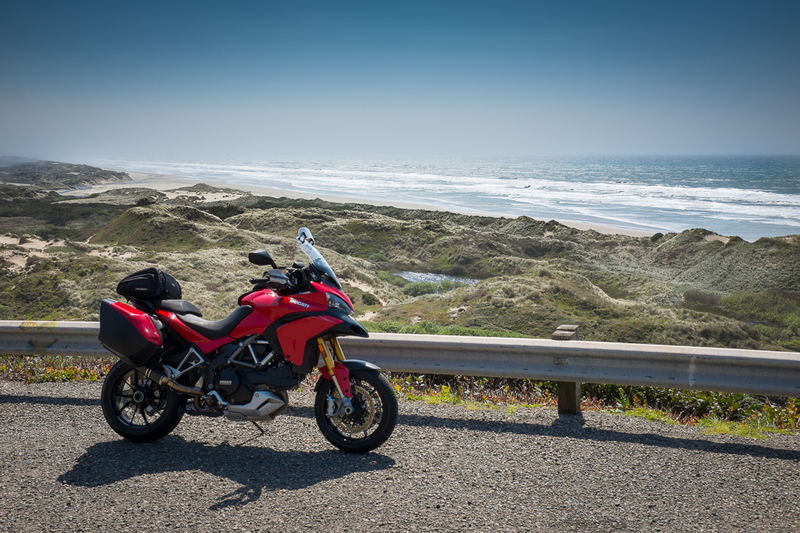 Sunday morning I headed north to Lincoln City, grabbing some more beautiful ocean views along the way. Crazy to be able to pretty much just ride up to the edge of the beach and take a photo, but thats just what I did, which was a dream come true. 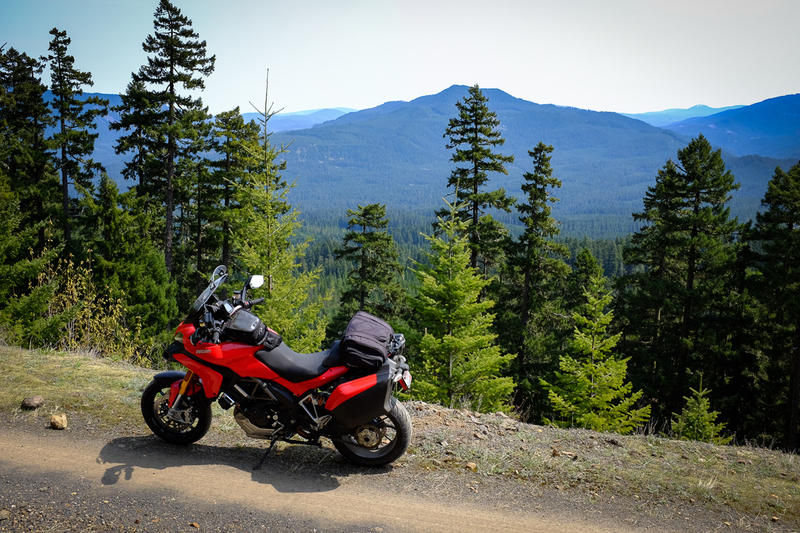 After being so spoiled the day before, the next couple of hours of riding were pretty ordinary, but still pleasant, as I made my way through Salem-Keizer, and headed toward the mountains. Along the way I saw another reminder of how much they like green things in Oregon. 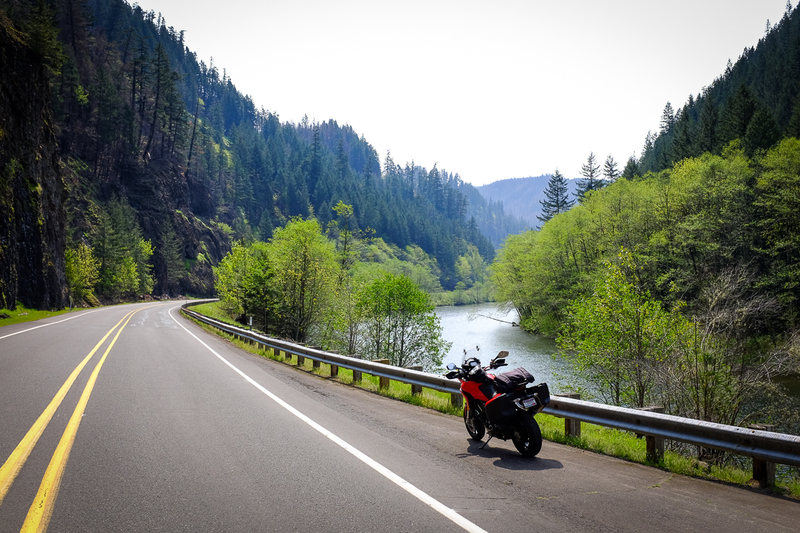 I stopped for lunch in Estacada, and then headed down another AWESOME road  Hwy 224 and then NF-46 toward Detroit. This one is usually closed due to snow until later in the season, but Im sure glad it was open this April, as it was really fun. 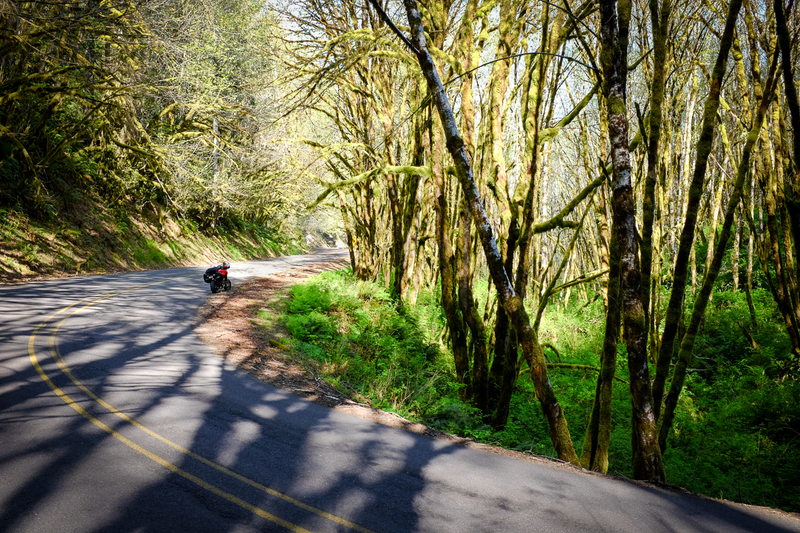 Quite a few motorcycles on this stretch  and it was easy to see why. What a great road. 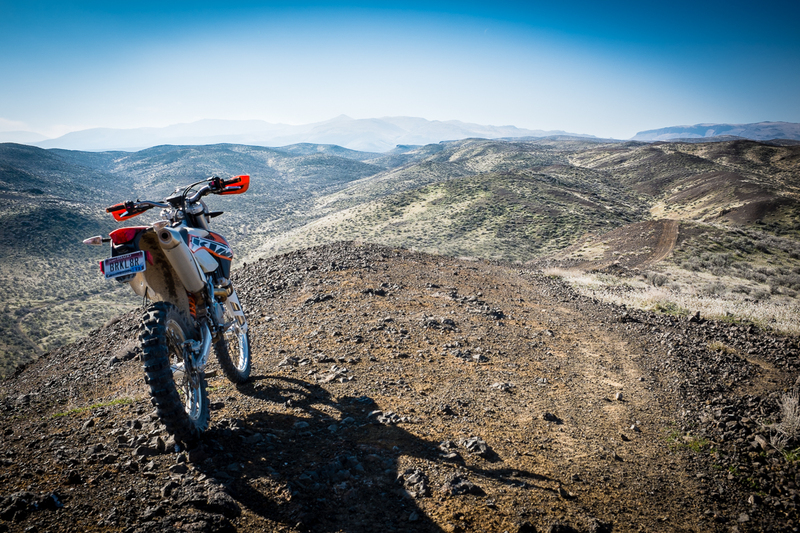 A little bumpy, I was glad to have good suspension on the Multi, as it kept my tires on the tarmac nicely. Along the way I got confused again and overthought the GPS. 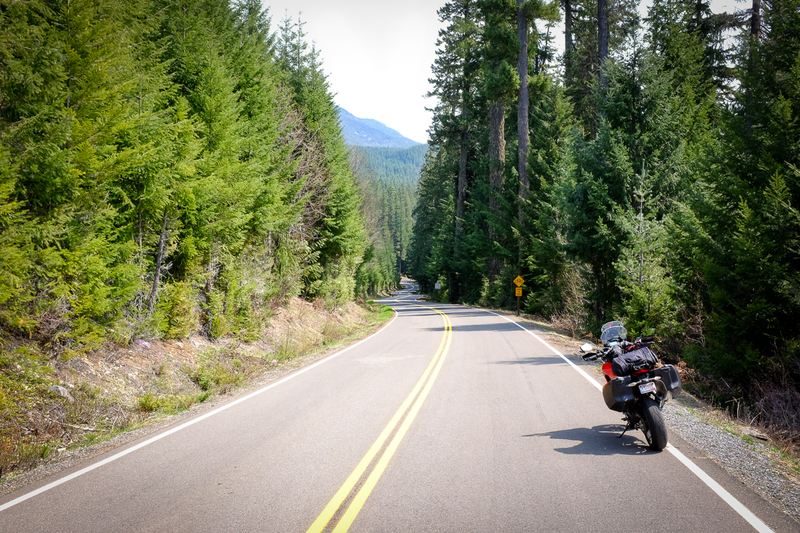 I thought, This highway is great and all, but Im pretty sure I had an even twistier route planned. I took a forest road detour, that seemed a lot like the more remote part of the Smith River Road Id done on Saturday. It climbed and climbed and climbed for nearly 10 miles, then became a dirt/gravel road. Hmmmm. I dont mind a little bit of this, but how much? And huge, muddy potholes  some of which had big sticks in them to warn people not to ride or drive into them because they were so massive. I saw a few people along the way  hiking, or gathering firewood, or burying bodies, or whatever they do up there. All of them seemed to look at me like, Really? Youre going up there? On that? I continued on for another few, very slow miles, and finally stopped to take in the view and reconsider my route. 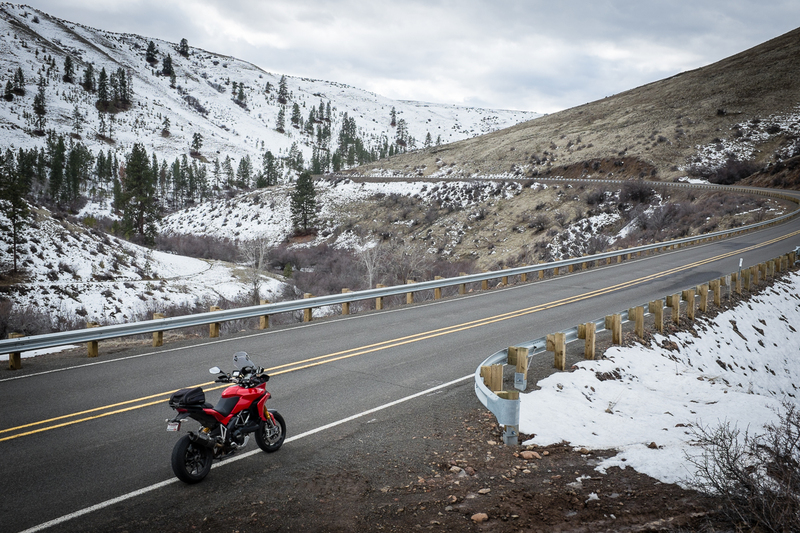 I knew if it continued like this Id either run into snow, or it would take about six excruciatingly slow hours to go 50 miles, so I decided to turn around and go back to Hwy 224. Im sure glad I did, because thats when it really started to get great! 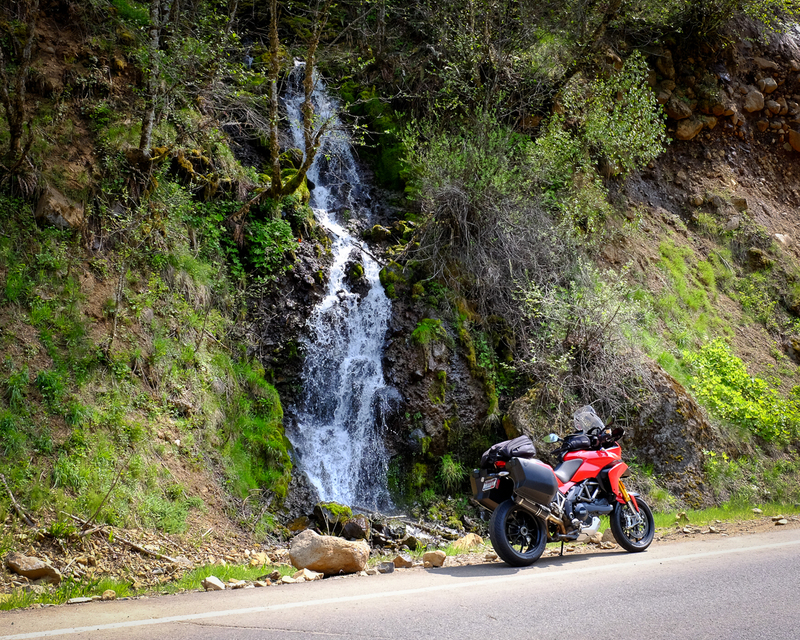 More roadside waterfalls, and twisty fun with almost no cars. Fantastic. 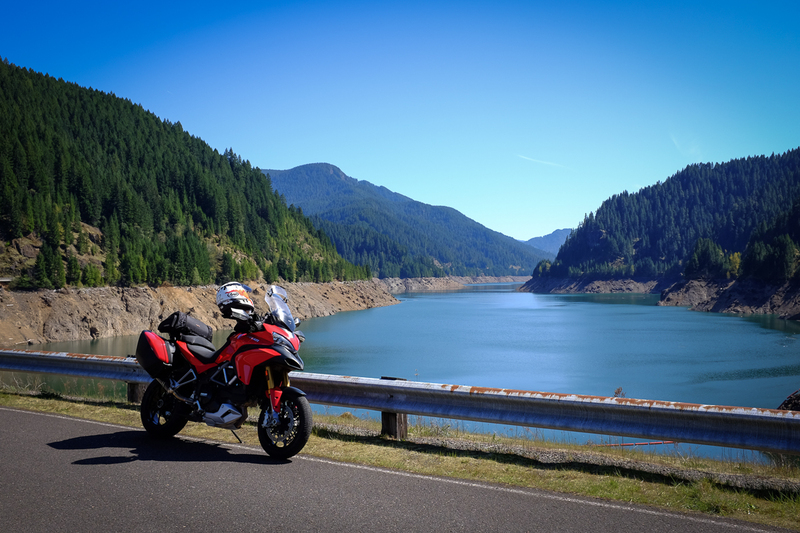 I stopped for the final bit of fuel before the home stretch to Bend in little Detroit, next to Detroit Lake. 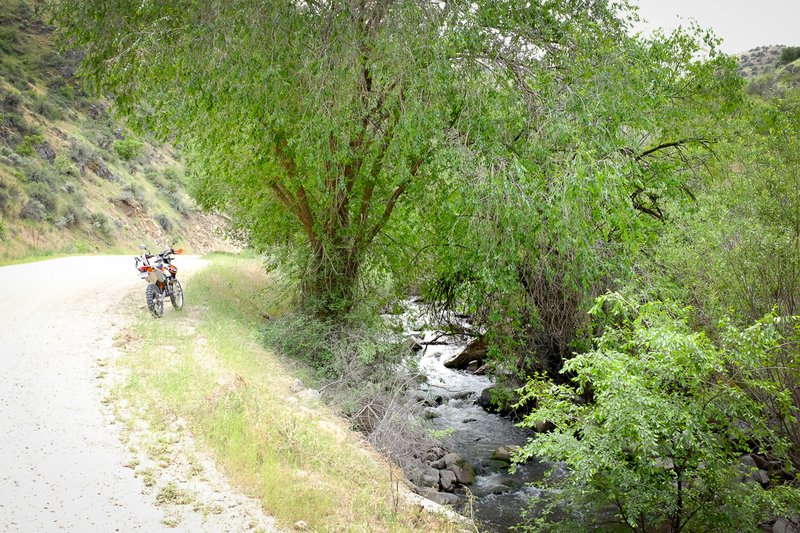 The final stretch was beautiful and relaxing, reveling in the amazing three days of riding Id just experienced. 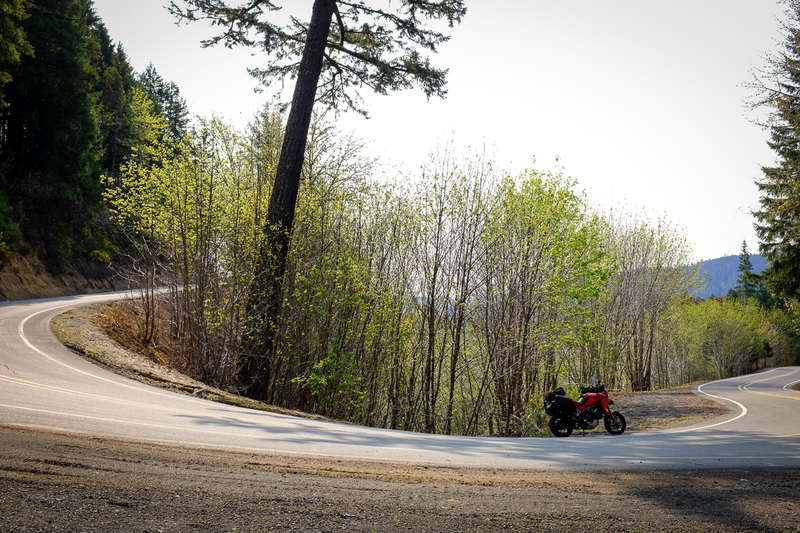 A lot of the riding trips Ive experienced have had amazing, spectacular scenery and fun roads, but also have their share of long stretches of mediocrity between the glorious spots. This one had the least of the mediocre stuff of any of them. Almost all of it was the stuff us riders dream about. I cant wait to go back. 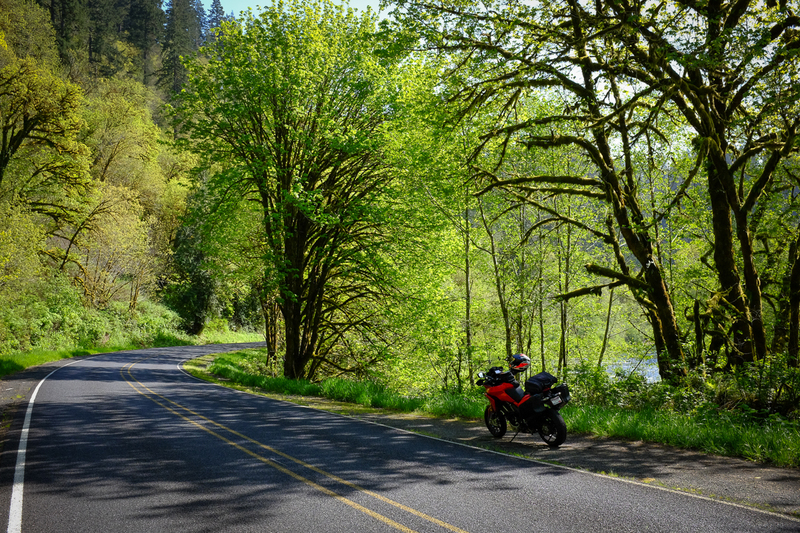 I imagine during the summer months a lot of the route may be clogged with tourists, but I was really fortunate to have such beautiful, warm weather in April, so I could enjoy all of it in relative solitude, which makes me and my bike very, very happy and grateful. Meriwether, mischief, PC7A and 5 others like this. Great shots and great thread. Thoroughly enjoyed your stunning images. Thanks. Thanks! I sure can't wait to go back. 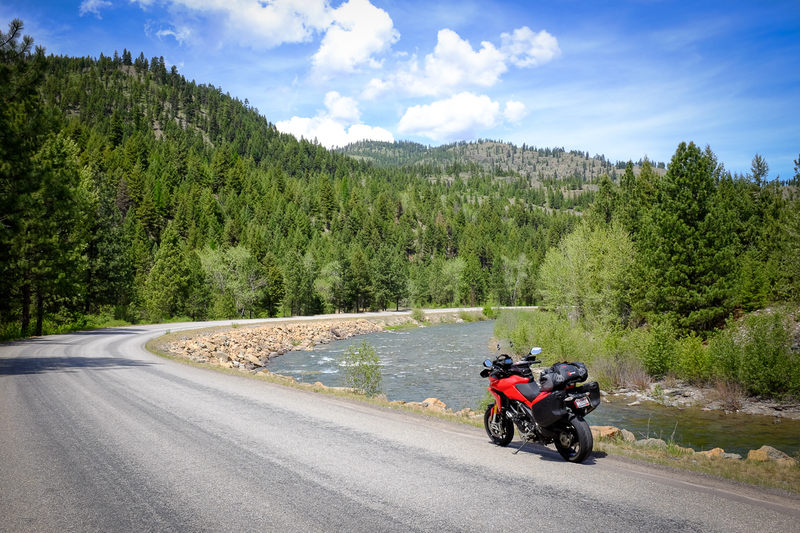 I decided to go for another touring ride for Memorial Day weekend. Well, sort of. Because I really don't like dealing with holiday traffic, I decided to stagger the days a bit for my weekend. 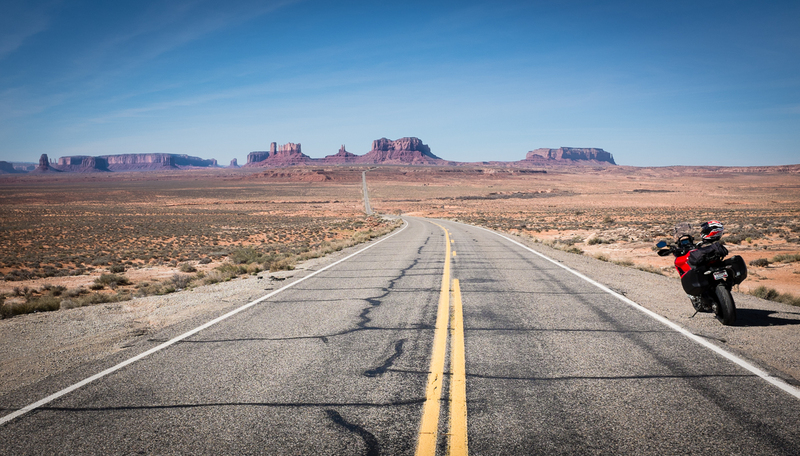 I'd leave Thursday and return on Sunday, hoping there would be fewer cars and RV's on the road. Thankfully, that's just the way it worked out! In the few days leading up to the potential getaway dates, I thought about where I might go, and hoped my work schedule would actually allow me to leave then. 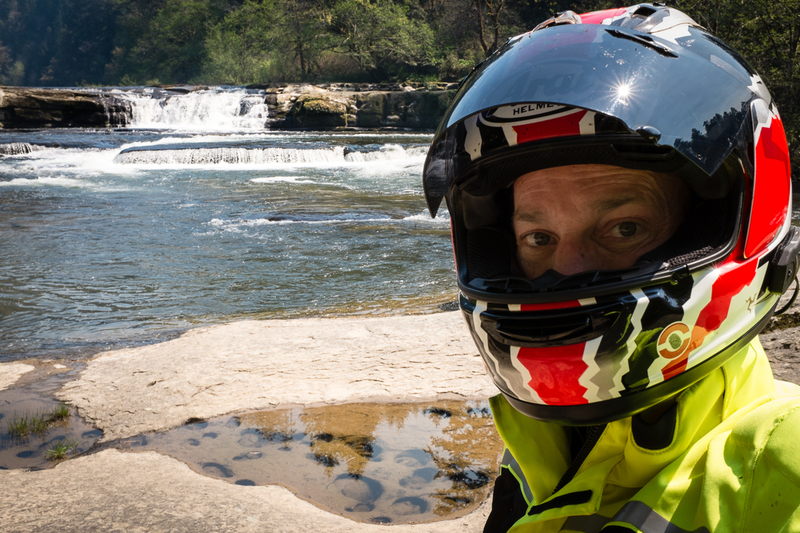 I really wanted to get to some new places where I hadn't yet ridden, and those are getting harder to find nearby. 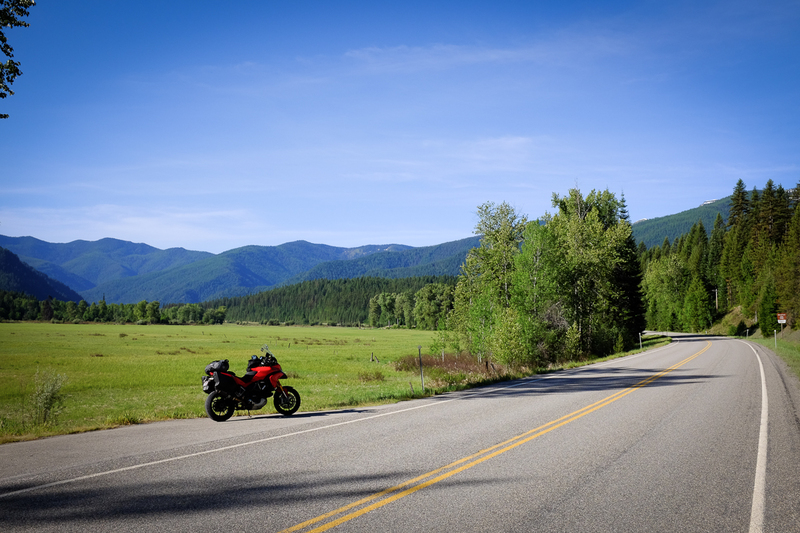 I finally settled on a route that would take me on a nice loop to the north, up into (very) northern Montana, looping back down into northern Idaho, and then returning home. 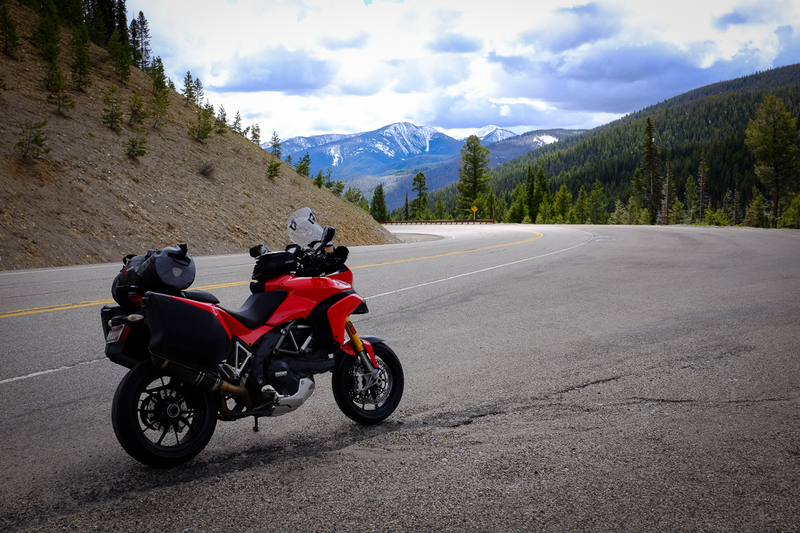 About 1400 miles over 3 1/2 days. Ambitious, but very doable. Forecast looked good up north, but down our way we've been in a pattern of lots of thunderstorm activity. 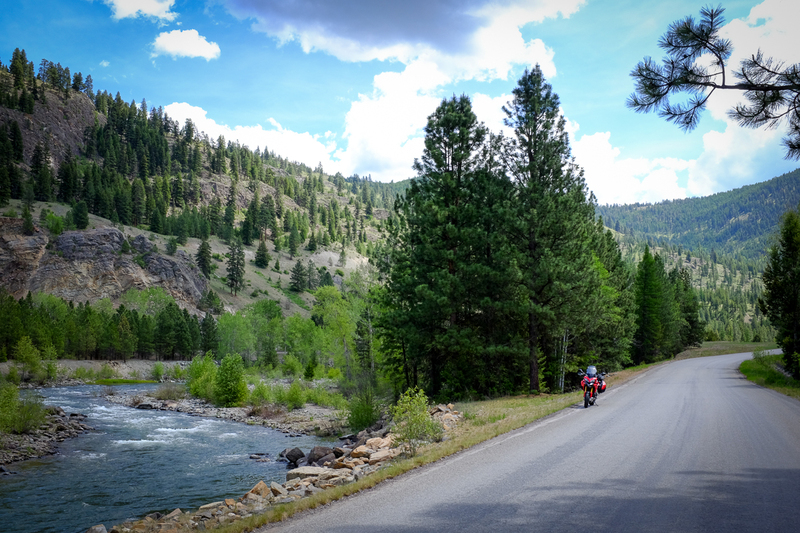 On Thursday morning I began the familiar ride toward Stanley, and then on up through Salmon up to Missoula, MT. As I approached Stanley, the previously sunny skies started to turn darker and darker. Yes, I was going to the left. And I got rained on. A lot. It would rain for 20 minutes, then be sunny for 10, then rain for 15, sunny for 5, back and forth, for most of the ride. I really didn't mind. I've got the gear to keep me dry, and I just love going on trips like these. It definitely means I don't take as many pictures, but I've traveled this route so many times that I'd be taking pics of pretty much the same stuff anyway. As I approached Challis, it wasn't raining, so I grabbed this photo of the pretty rocks there, where the bighorn sheep like to hang out. 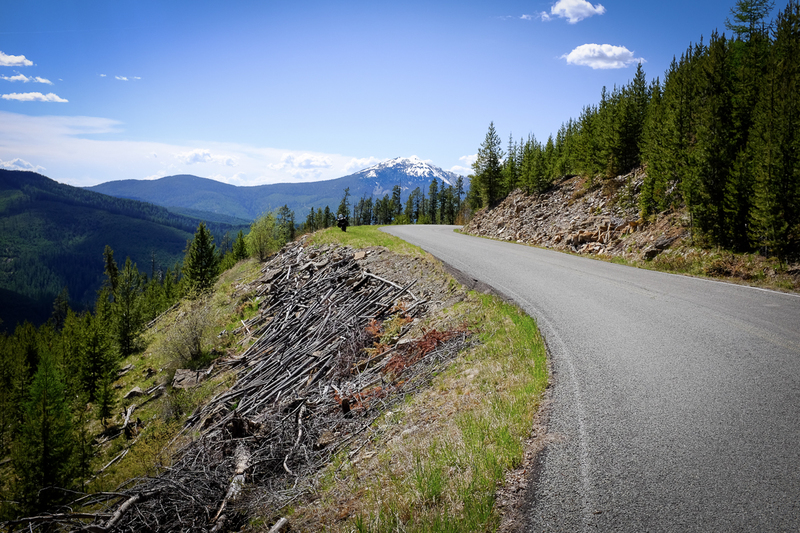 I always love the big climb up the hill that is on the border between Idaho and Montana. 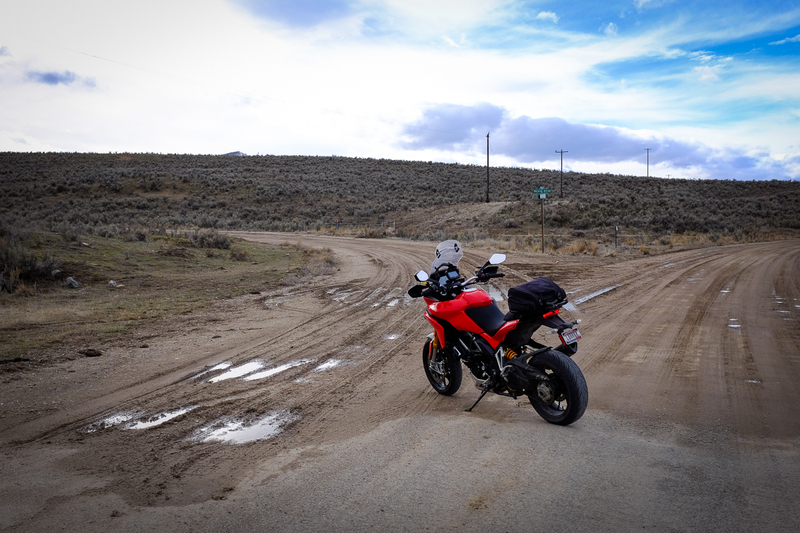 It was mostly pretty dry there, so I could warm up the tires a bit. 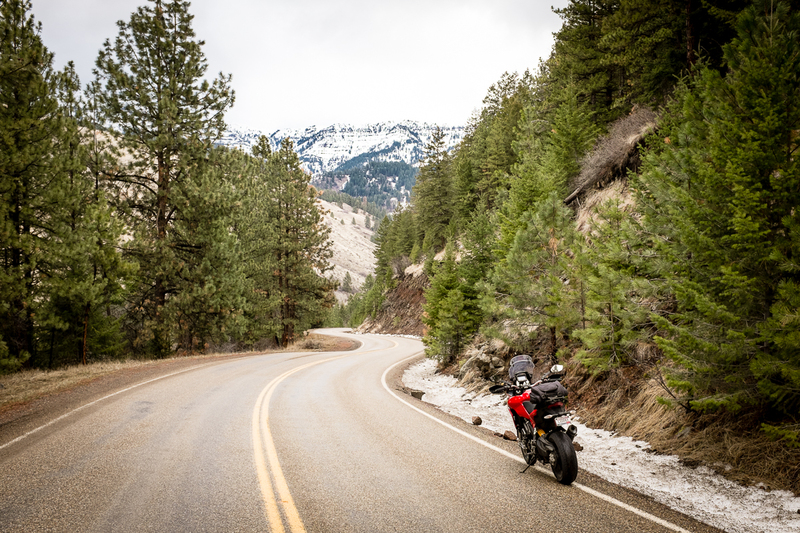 I spent the night in Missoula, and hoped for better weather on day two. 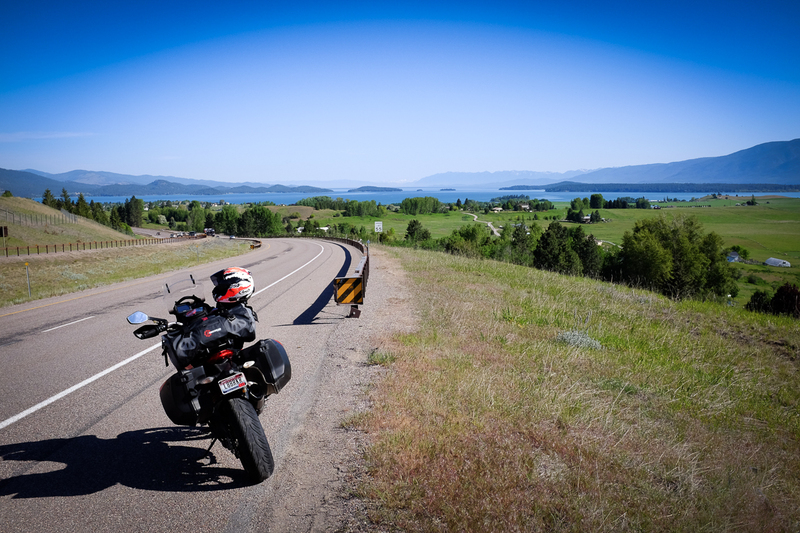 The next day's route would take me north along beautiful Flathead Lake, and long, narrow Lake Koocanusa, close to the Canadian border. 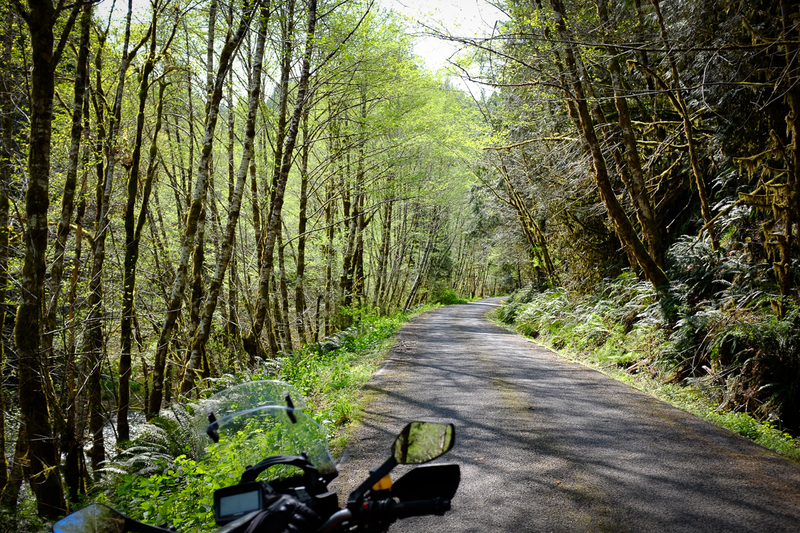 It was a beautiful day, pretty much perfect riding weather, which was really nice after Thursday's rain. 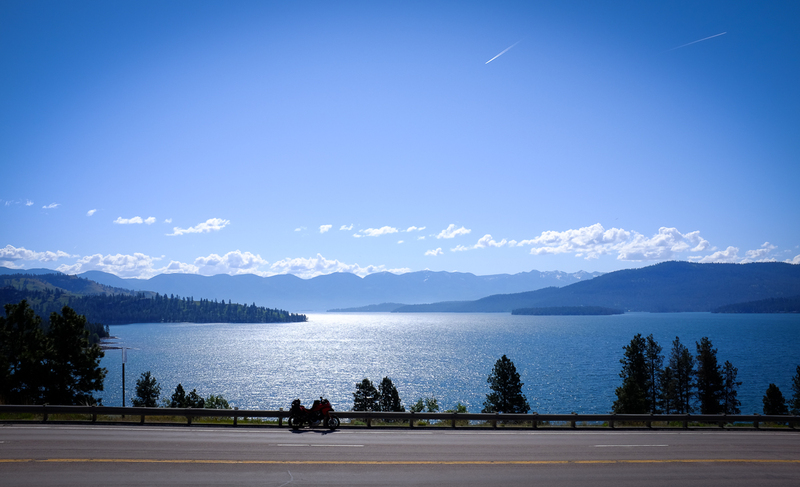 As I approached Polson and Flathead Lake, I had to stop and grab a photo of the view. 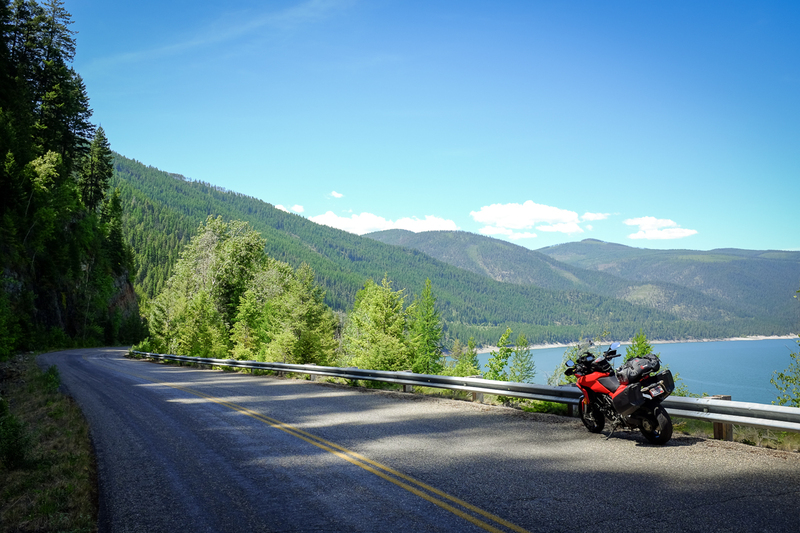 From Polson to Kalispell, I traveled along the west side of the Lake, and the views were stunning! I stopped at a little diner in Kalispell for brunch, since I didn't know if I'd have many food options in the more remote areas where I was headed. Headed to the west along Hwy 2, there were some beautiful smaller lakes, that made the twisty road even more fun and scenic, like Lake McGregor and Logan State Park. 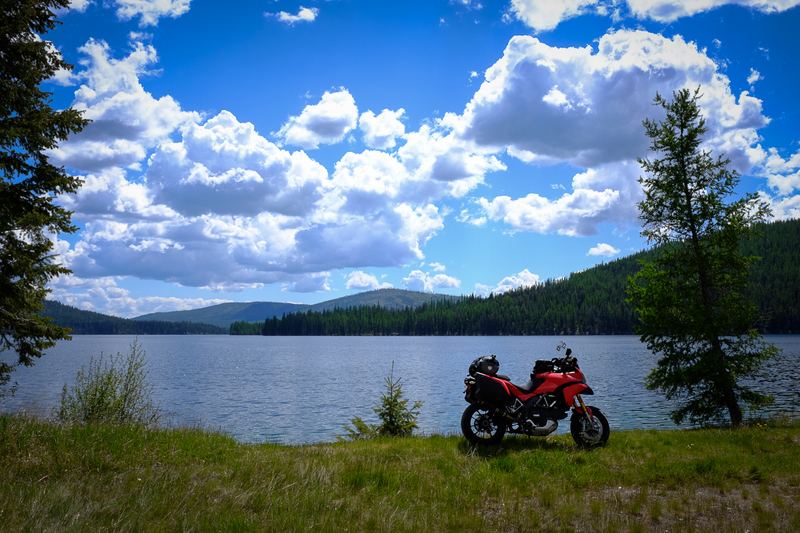 I turned north on Forest Roads 535 and 763, for a bit of a shortcut to Lake Koocanusa. It was beautiful, and very remote! Hardly saw another person along the route. 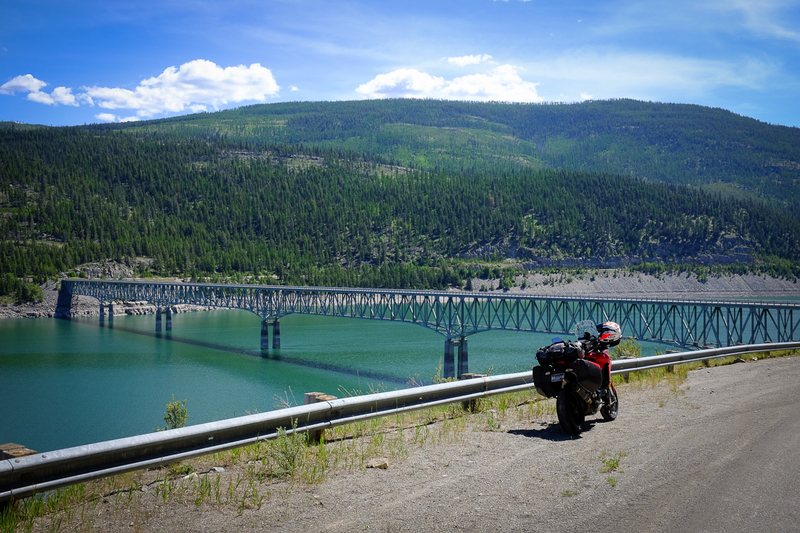 I took the bridge across the Kootenai River, and was very excited about heading back to the road along the west side of Lake Koocanusa, which I'd ridden once before, with friends back in 2011. I remembered it as being ridiculously fun, twisty, secluded, and scenic. I started to climb the hill, looked ahead, and couldn't believe what I was seeing! What's worse than tar snakes? Tar snakes that still have their stupid slippery applicator papers still on them! Never seen that before! Ridiculously, dangerously slippery for bikes. Oh no! Was the whole route going to be like this? Should I turn around and take the road on the east side of the lake instead? 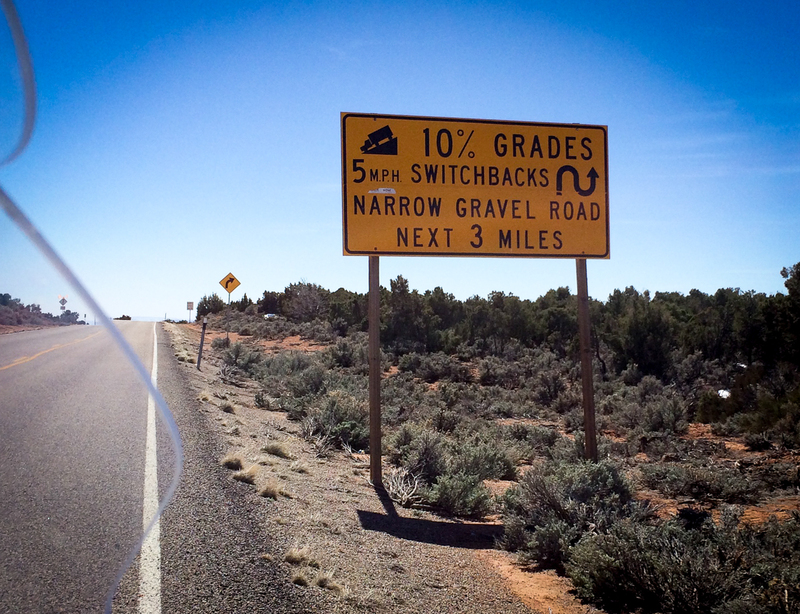 (still a great road, but not AS great). 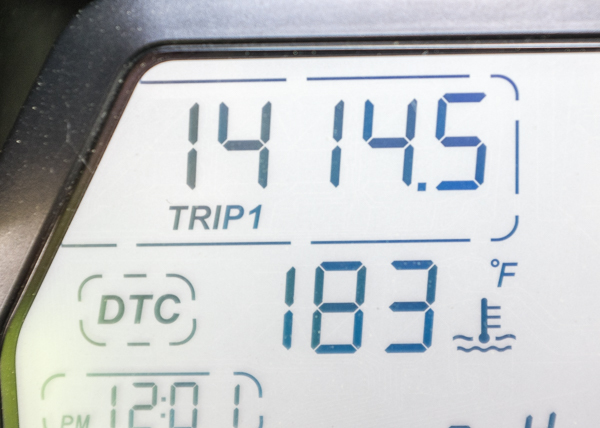 I proceeded another mile or two, feeling like I was riding on an ice rink, and then finally the fresh goo paper stopped, and I was able to get on the gas and go! And man, it was just as fun as I remembered. Again, virtually empty, like a private 50 mile long track all to myself. Awesome. And great views! 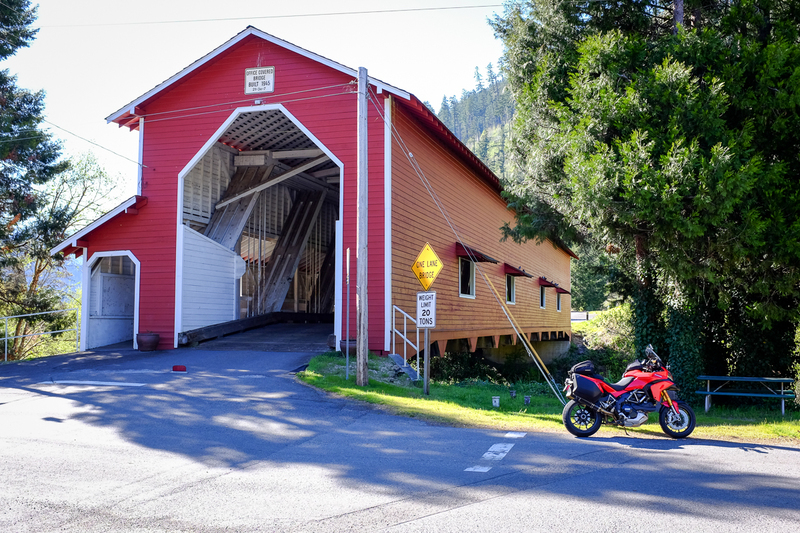 I was running low on fuel, and didn't think I'd make it to Libby going on the long route I had planned through Yaak, so I crossed the bridge and rode the 10 miles or so to Eureka to gas up. 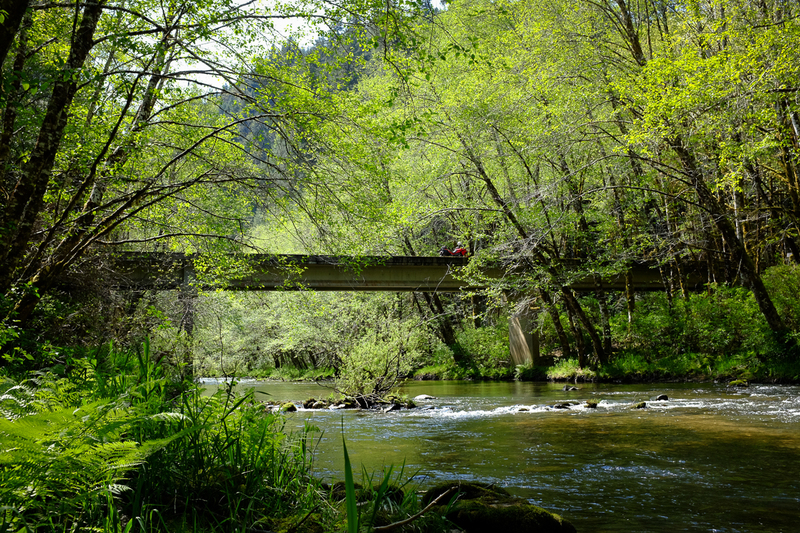 Then, I came back across the bridge and proceeded over toward Yaak. This was a super tight, twisty, hilly, and very remote route. Pretty bumpy too, but still lots of fun, and very scenic. 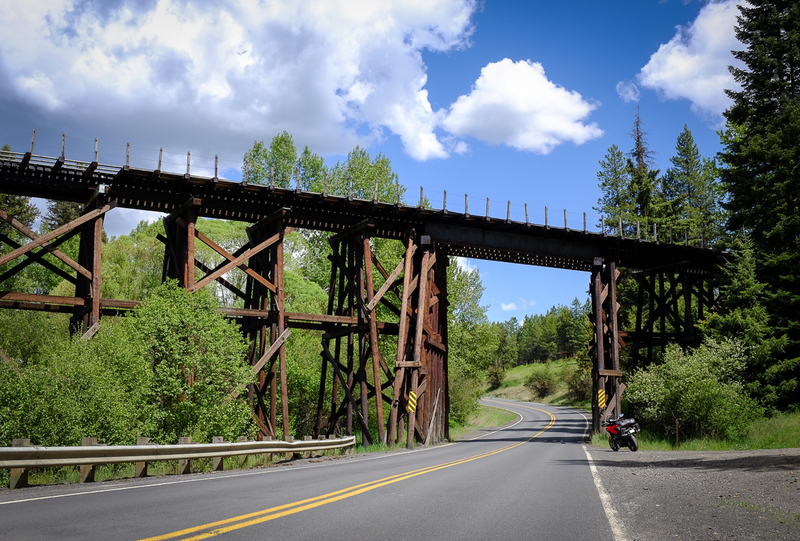 I passed through the tiny little town of Yaak, and headed south toward Libby, where I'd spend the night. I was worn out, after a long and really fun day. Unfortunately, there weren't many hotel or food options in the area, so Libby it was - which had a real shortage of either. Motel was adequate, food was horrible, so I was ready to leave the next AM and get back to civilization. Saturday was another beautiful day! Good morning, Montana! 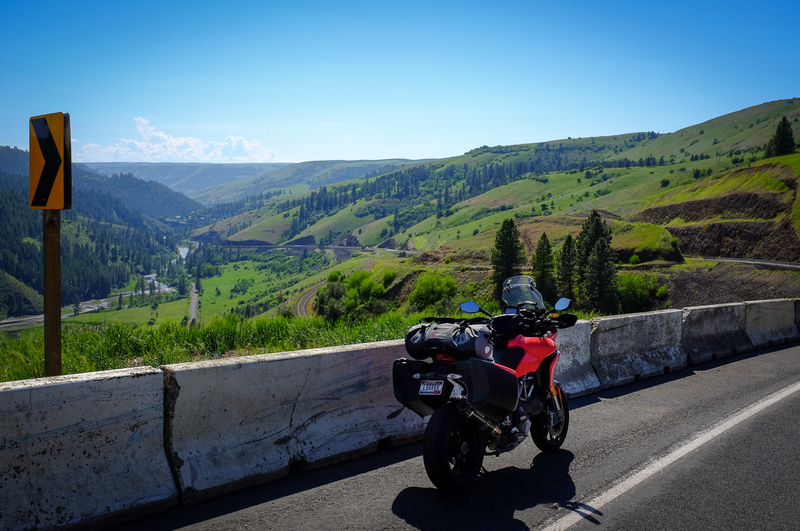 I crossed over into Idaho, and had a blast riding more fun and twisty roads through the forest. 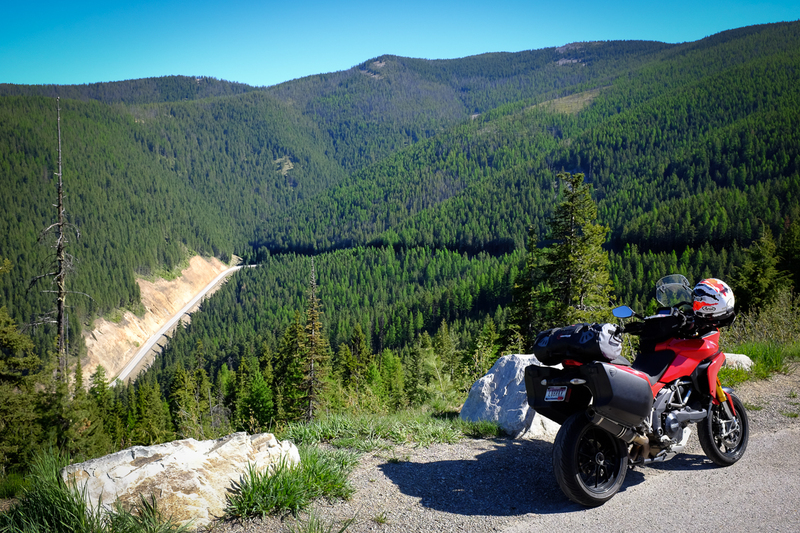 One of the real highlights of the trip was a particularly awesome stretch of road north of Wallace, Idaho - the "Nine Mile Road." WOW! 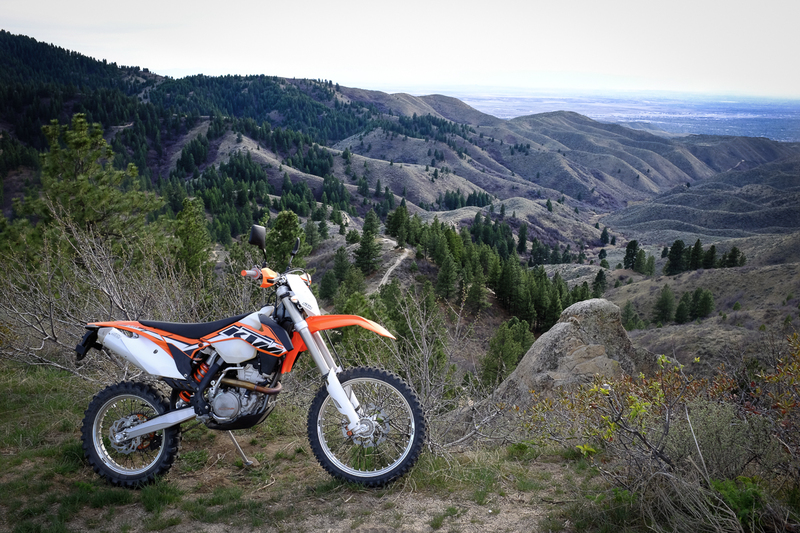 Steep, super twisty, amazing views, so much fun! Really glad I found this one. 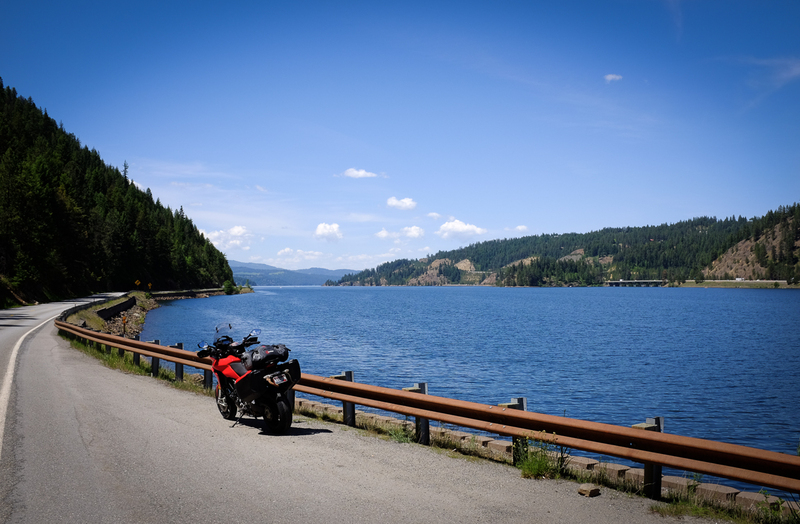 I stopped for lunch in Wallace, then turned around and went back up the Nine Mile Road, and then headed west along the Coeur d'Alene River road, and then got on the highway briefly and headed over toward the lake. 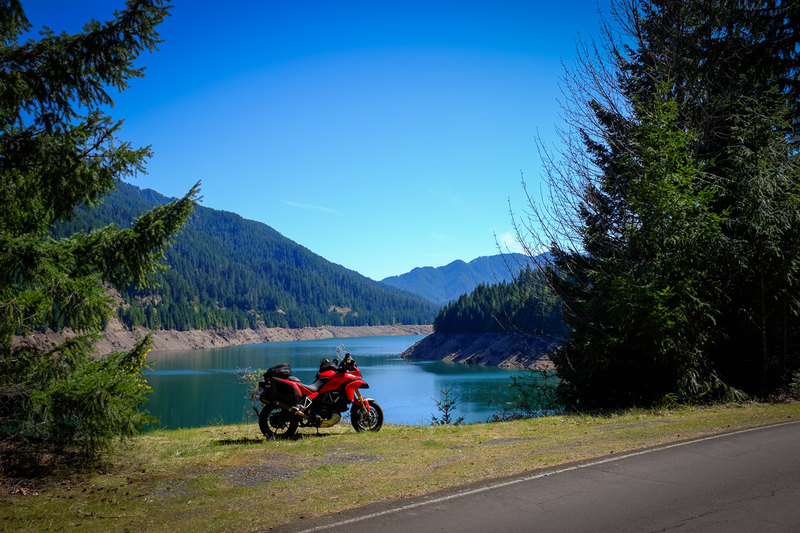 Another awesome highlight was Hwy 97 along the east side of the lake. AWESOME!! I worried there would be lots of holiday traffic, but it really wasn't too bad. I had a blast, and of course stopped along the way for a few pics. I headed south toward St. Maries, and my ultimate Saturday evening destination of Lewiston. Heading down the hill toward Lewiston, I saw this beautiful view and had to stop for a pic. 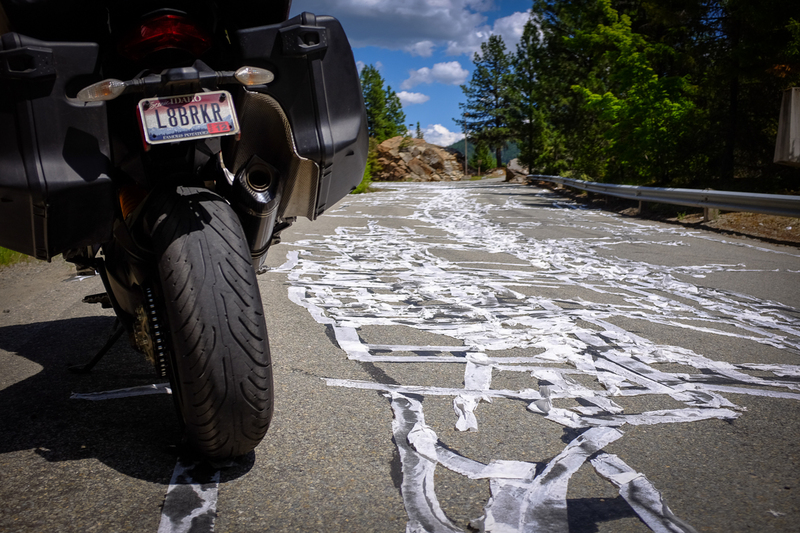 Of course, no visit to Lewiston would be complete without a stop at one of the twistiest roads any of us will ever experience - the "Old Spiral Highway." This road is incredible. Not very long, but seems like it was completely designed for motorcycles! Perfect, grippy tarmac, banked around the corners just perfectly, it's unreal. 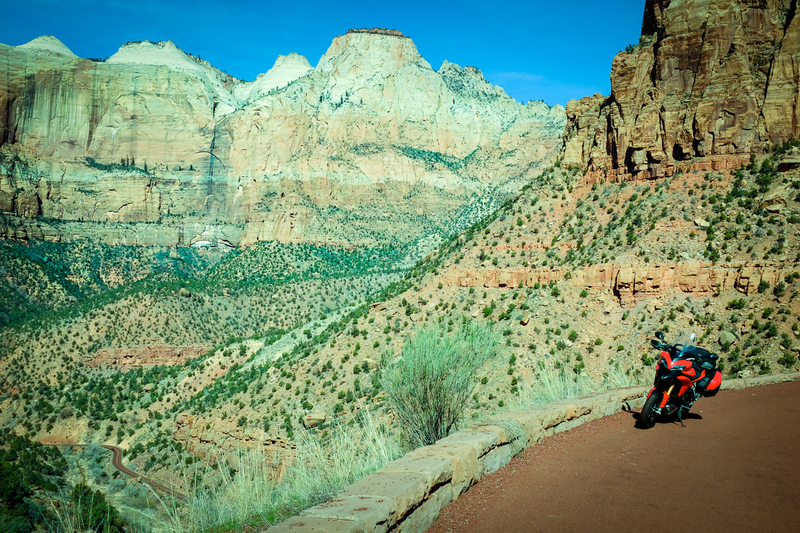 The views at the top and along the route are quite breathtaking too. Amazing. Had a nice night in Lewiston, with much better hotel and restaurant options than the previous evening in Libby! 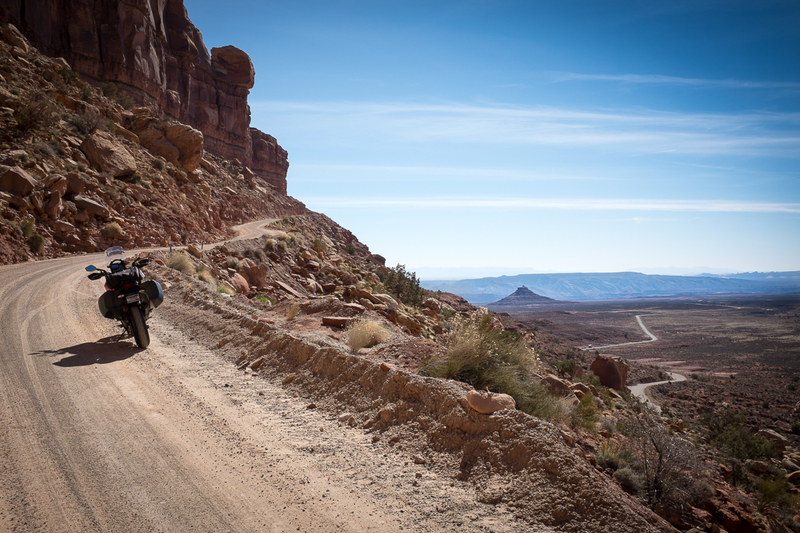 The next day would just be a simple and beautiful ride back down toward home, the shortest leg of the four days. 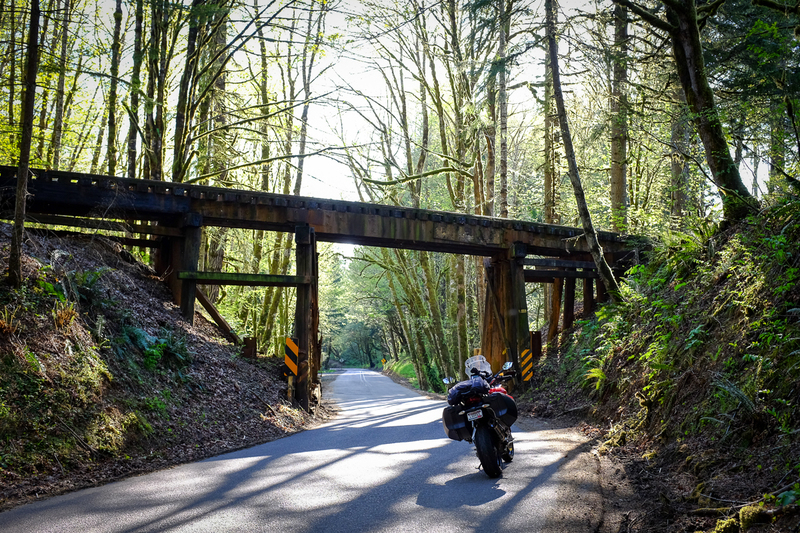 I thought about doing some other, longer options, but they're all roads I've ridden and photographed, and I was ready to get home and get back to work after taking a couple of days off. 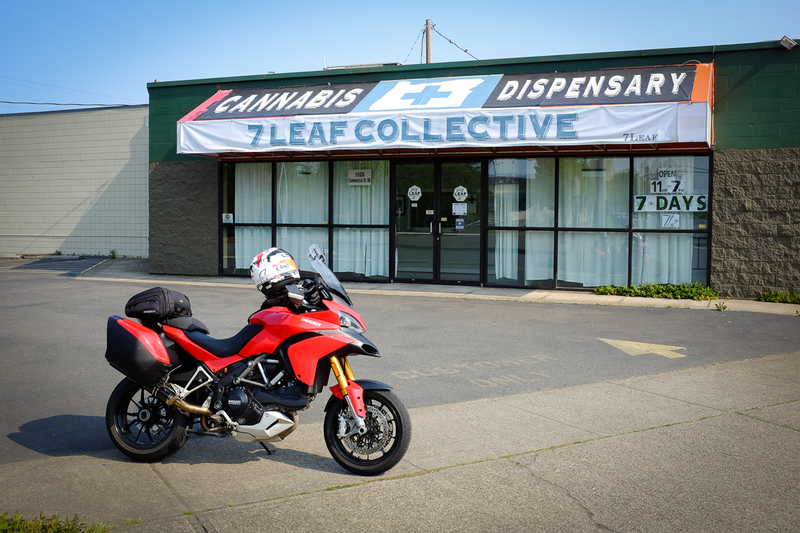 I had to stop at a couple of spots along the way for photos. Several years ago I'd spotted this cool old gas station in the little town of Craigmont, and regretted not stopping for a photo. So, I took a little detour to go see if it was still as I remembered it. It was! 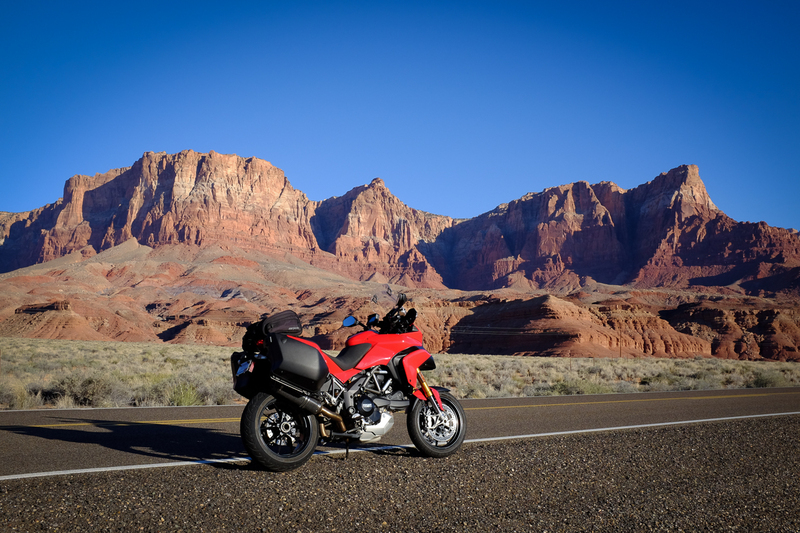 Ducatista meets Americana. I also stopped at the top of White Bird hill, because the views are just spectacular before the dramatic drop into the canyon. All in all, another absolutely awesome trip! 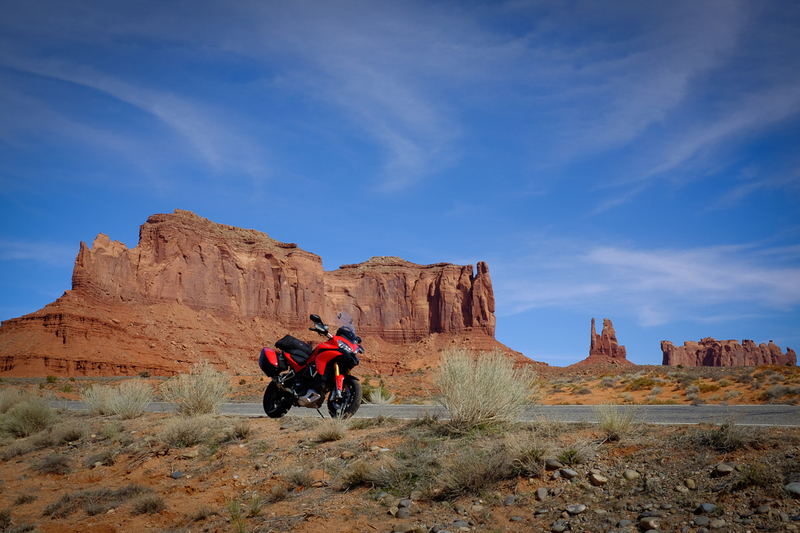 Just over 1400 miles of pure fun, thrills, and beauty. I couldn't be more grateful! Excellent thread! This is what Day Trippin is all about. Wonderful photography and good choices of what to include. I really felt good like I was riding along. It made me want to be there. Thanks and looking forward to more. Thanks very much, guys! I really appreciate it. In the 90's here today, so I decided to head for the hills to cool off a bit. 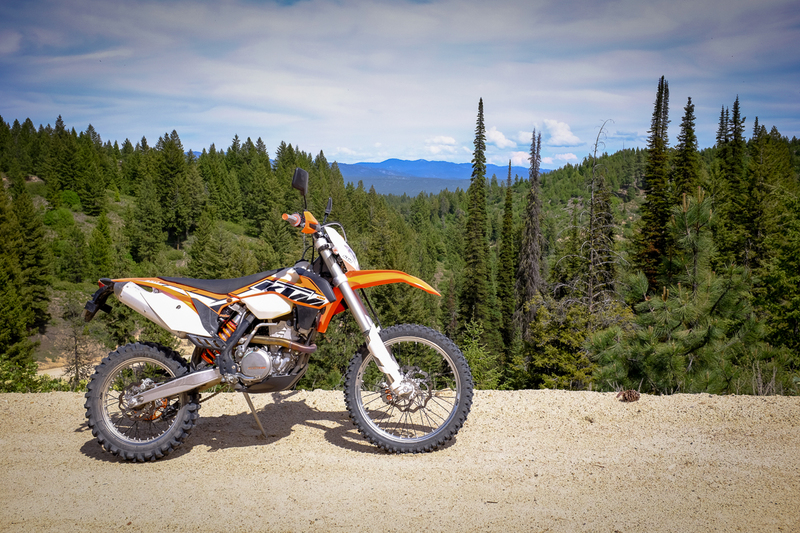 I'd heard I could ride from near my house all the way to Idaho City on mostly dirt roads, which I'd never tried before, so I figured I'd go explore. Just six or seven miles from my house, it started to cool off as I climbed the hill between Boise and Horseshoe Bend. From Horseshoe Bend I took a road toward Placerville, which started out as asphalt but quickly turned to dirt and gravel. 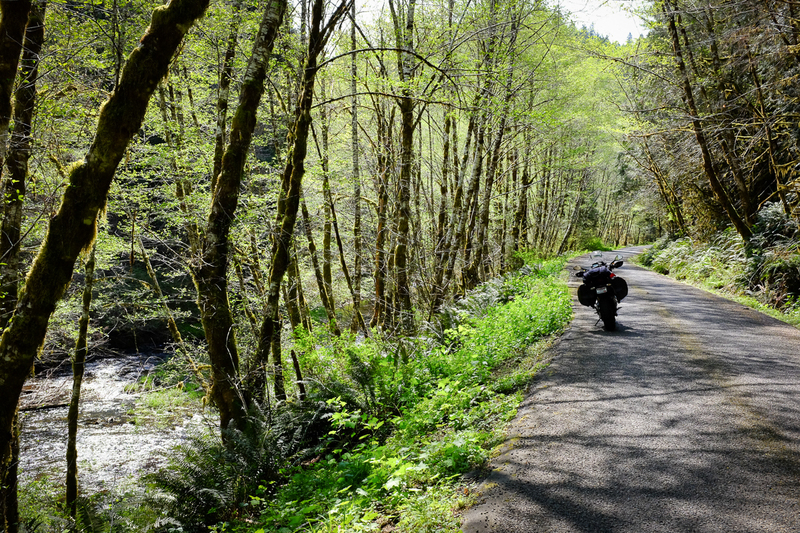 Much of the length of the road was alongside a winding creek, which was nice. Didn't take long before I was up in the pine trees, and the temps were 15-20 degrees cooler than in the valley, which was really nice! 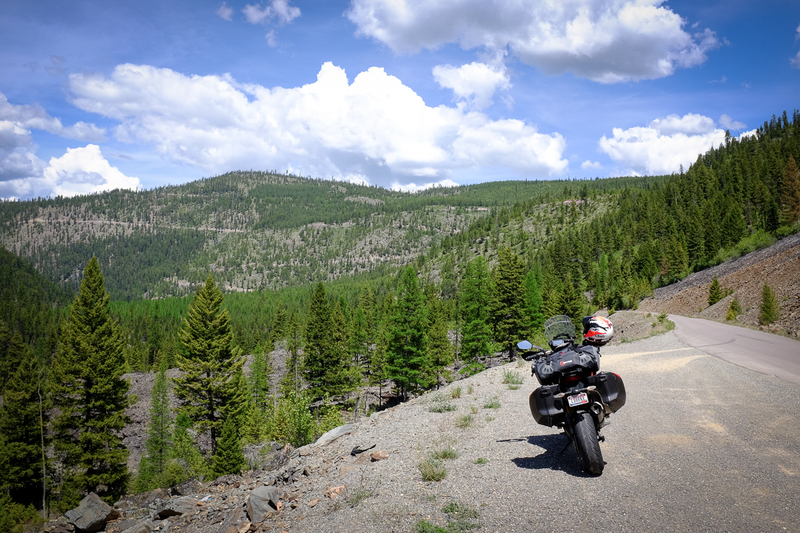 I stopped in Idaho City (about 55 miles from home) for fuel and a cold drink, and then headed back. Some nice views along the way! 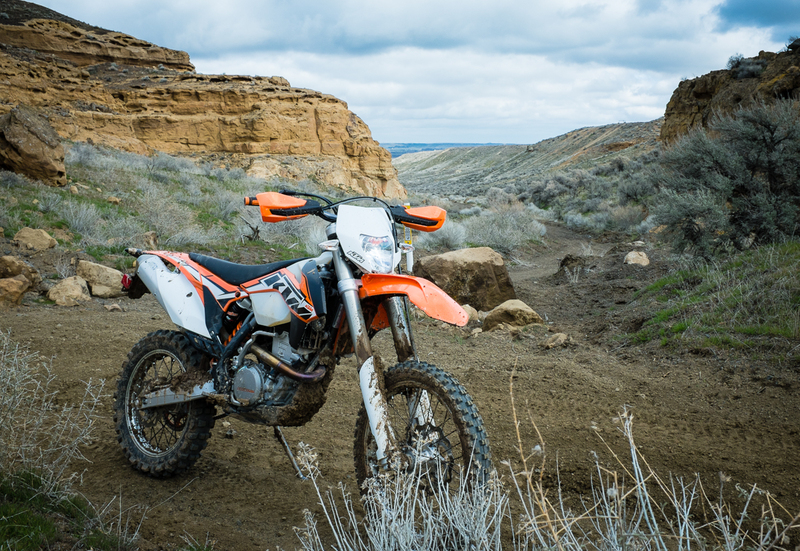 The road was mostly pretty smooth except for some washboard sections, and it was fun to slide the bike a bit around the corners as I get more comfortable with the KTM and riding in the dirt (since I've been much more of a street rider for many years). Meriwether, BackRoadNomad and The_Scottsman like this.